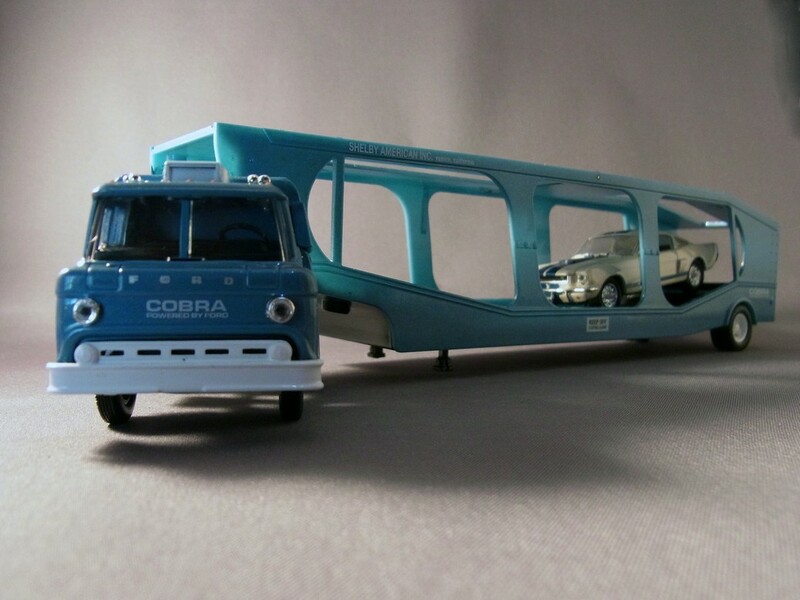 The first generation of the Ford E-Series van ran from 1961 to 1967 and was a very common sight in films and TV shows set in US cities in the Sixties. 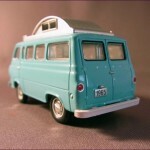 They were widely used by Utilities like Bell Telephone and were also a popular van for conversion into a camper. 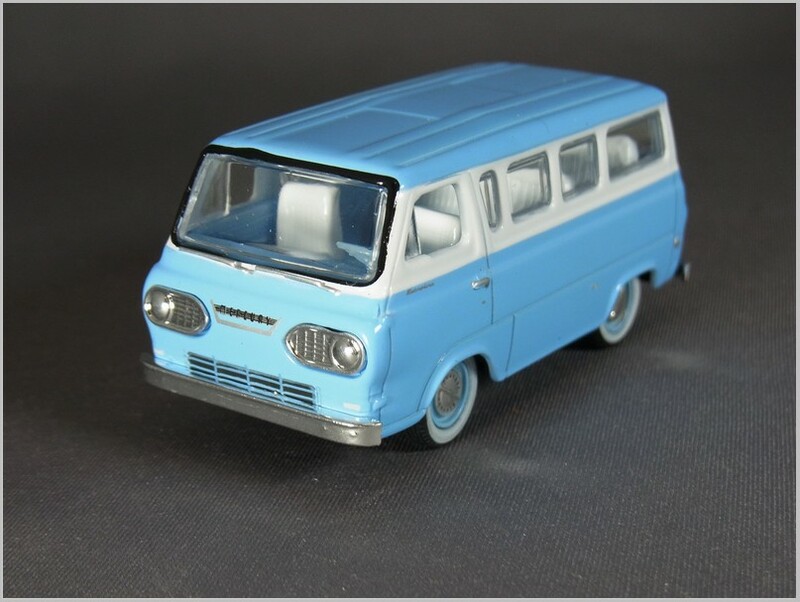 Based on the mechanical underpinnings of the compact Ford Falcon automobile, the Ford Econoline was said to be based on sketches started in 1957 when the British Ford Thames 400E it resembles was launched in the UK. 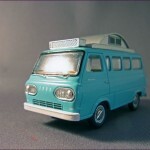 The van competed with the Volkswagen Transporter, Chevy Greenbrier and Dodge A100. 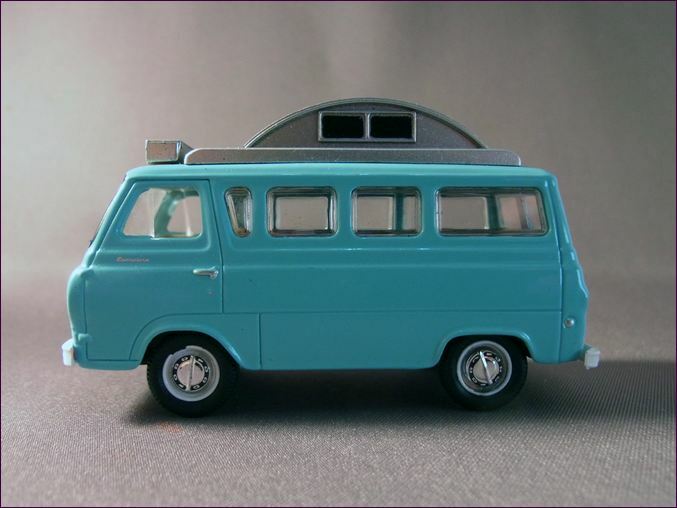 The vehicle was sold in van and pick up form as an Econoline and the station bus passenger van was sold as a Ford Falcon Club Wagon. The van was fitted with a 2.4 Litre inline 6 initially and engine sizes grew to 2.8 Litre and then 3.9 Litre over the years. The front mounted engine was in the centre of the cab and gave the van “nose heavy” characteristics so Ford fitted a 165 lb (75 kg) counterweight over the rear wheels. The van was also sold as a Mercury. 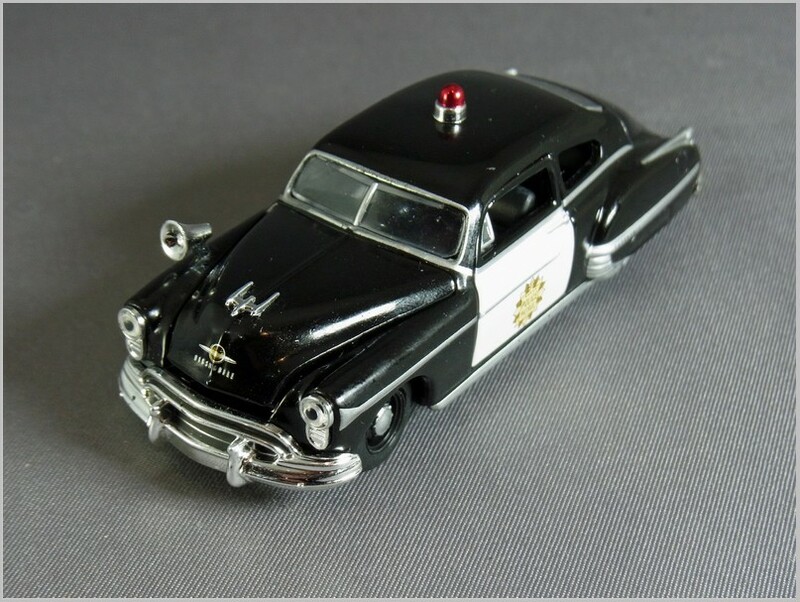 Initially made in Canada the Mercury production was later shifted to the US and was always a low volume exercise. 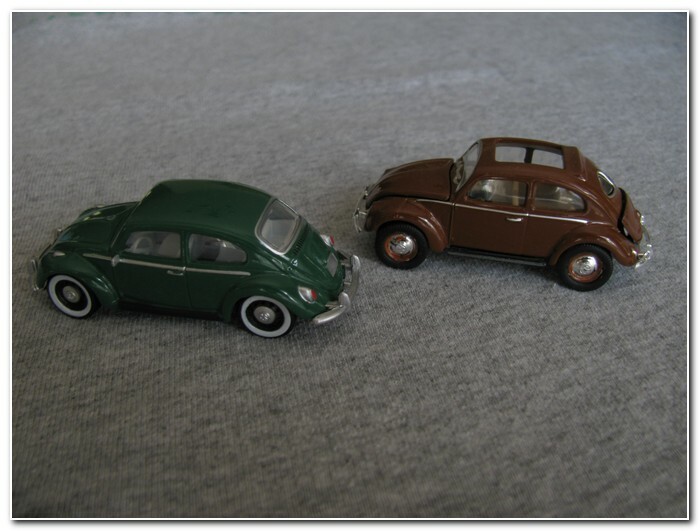 This article looks at two of the many Econolines produced by M2 to 1:64 scale diecast in China. 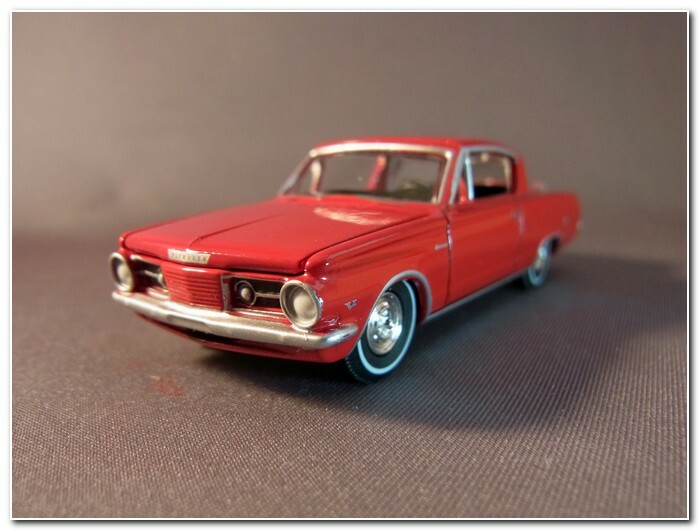 M2 are premium price 1:64 models which compete with AutoWorld and Greenlight rather than Mattel Hot Wheels. 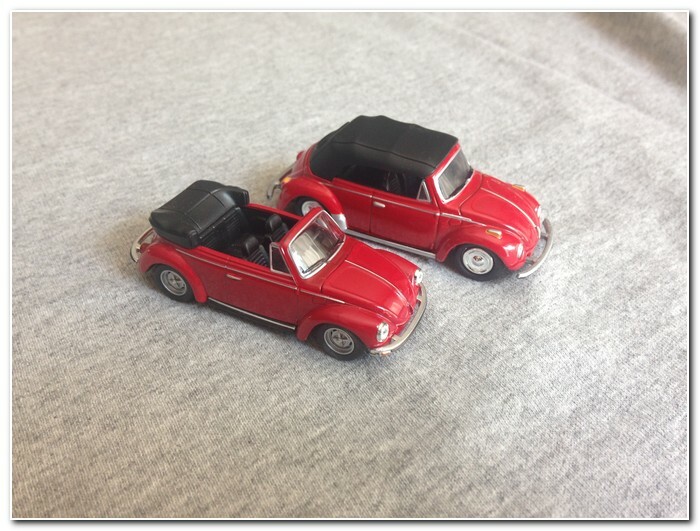 M2 have produced these models as custom vehicles, lowered and with special paint jobs as well as the more conventional versions seen here. 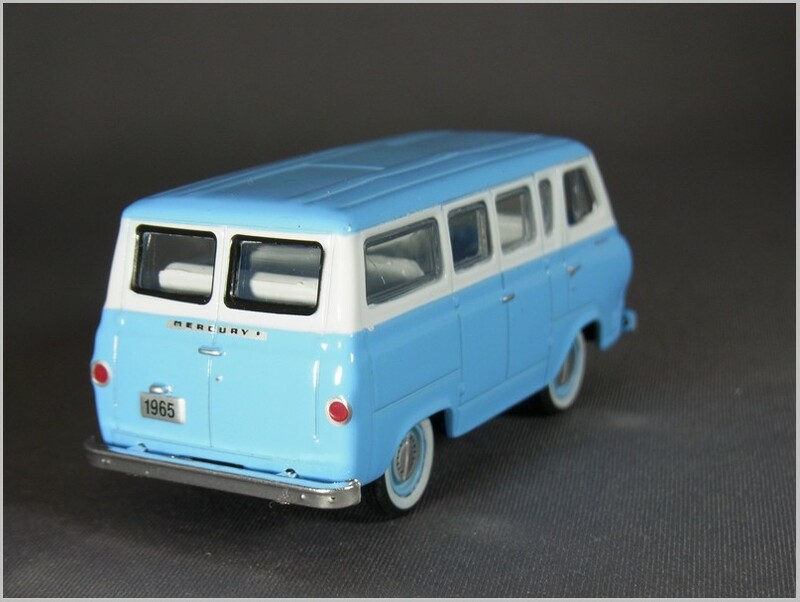 The Mercury van differs little to the Ford other than in badging, but this passenger van would have been badged as a Falcon Club van when sold by Ford. The side view shows that the split two tone paint has been very neatly applied and the windows have been made in such a way that they push fit into the aperture to give a more realistic finish. The black surround to the front window is not very well printed with distinctly wobbly lines on the one I have. This is a shame as all the other printing like wipers and air vents is very good. Wheels and tyres are very good. and the front light inserts with the grilles to the side of the lights well realised. 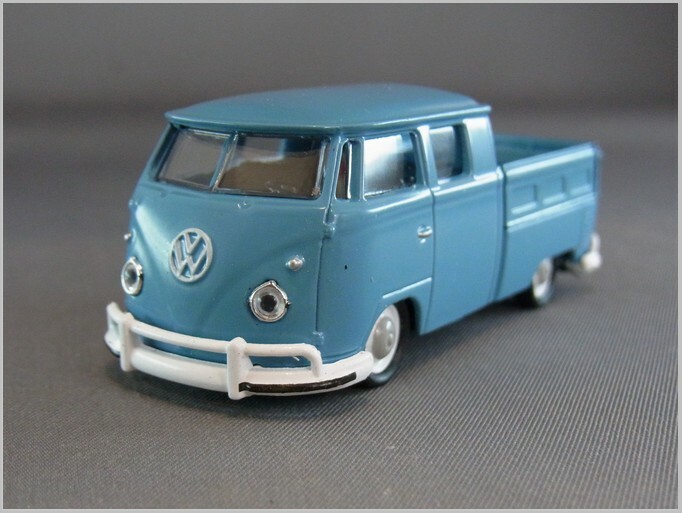 The panel lines showing how the van was welded together from multiple pressings are well engraved and the paint covers them well without obscuring any detail. At the rear the Mercury script is neatly printed and the lights printed effectively. This is available in two versions. 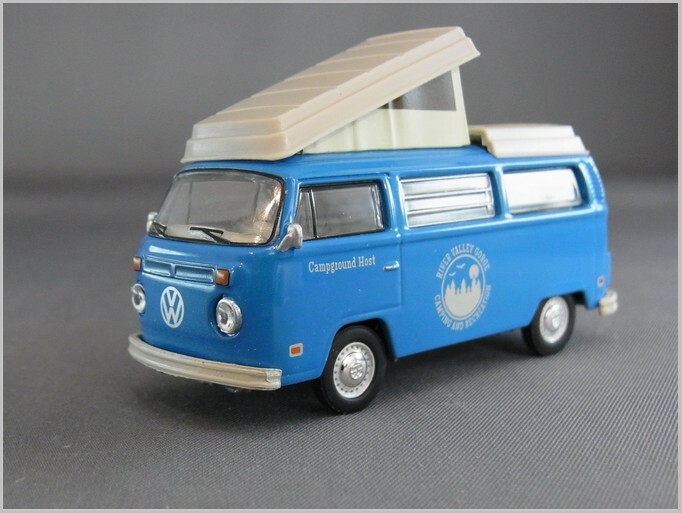 One with the full elevated roof as shown here and the other with a raised panel which could be folded up with a canvas side when parked. 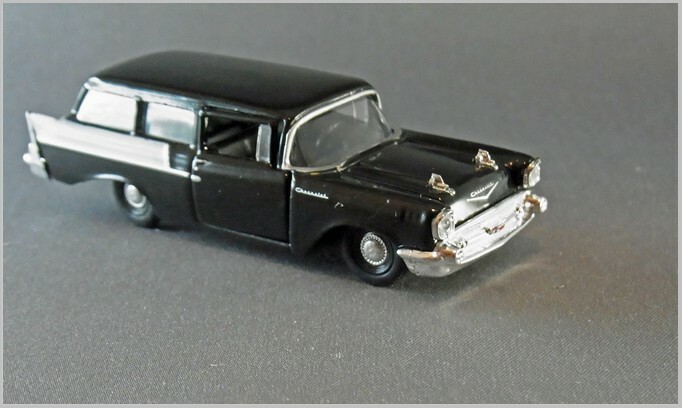 This model shows how different the US and UK were in the 1960s. On top of the cab is fitted an air conditioning unit something we would not see in the UK on smaller campers until much later. 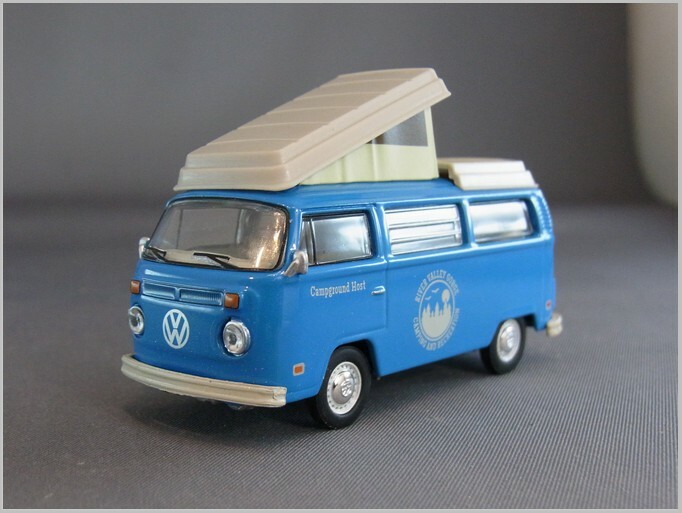 The raised roof dominates the model. 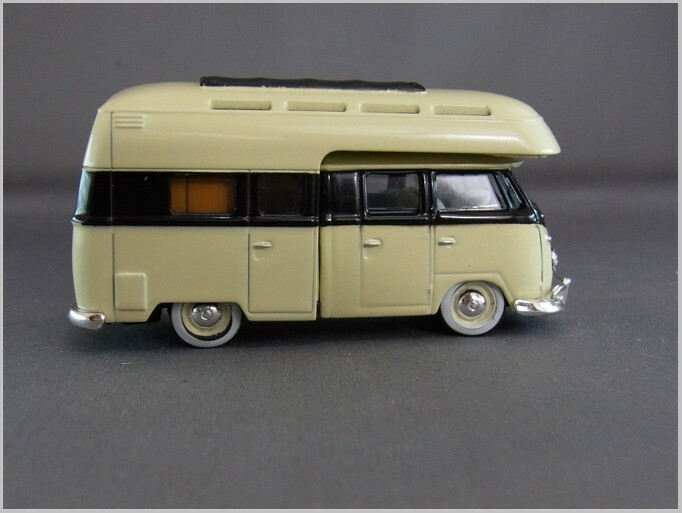 It is nicely modelled in plastic but the windows are printed on. In front of it sits the air-con unit which is another separate plastic item. Below it, the middle windows are moulded-in sloping as if they have been propped open from within. A table and some low side units are moulded in the interior as well as some thicker seating which will clearly become the bed when the van pulls up. 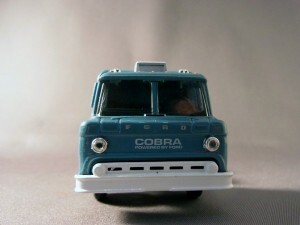 The two tone paint separation on the side is again neatly done as is the tiny Econoline script on the cab doors. 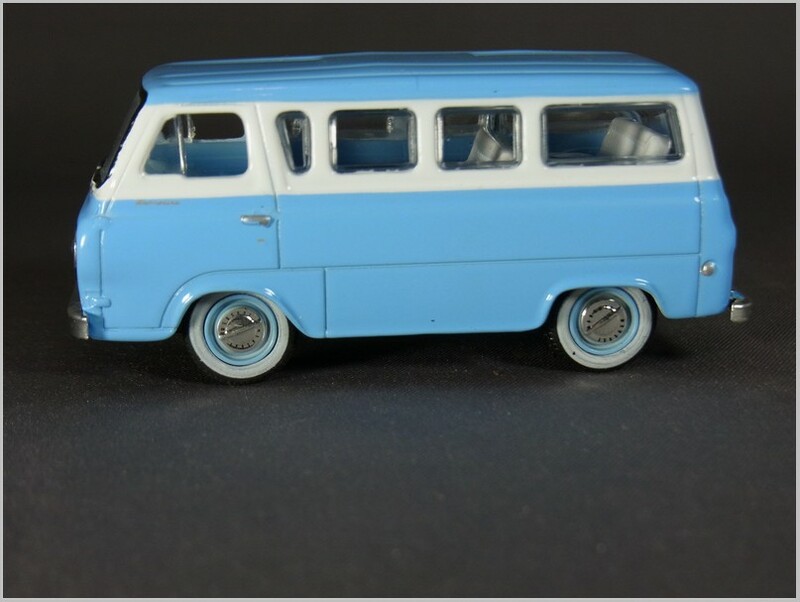 Again the wheels and tyres are well modelled. To the front the Ford Script is clearly printed and other features are like the Mercury above, except for the bumpers which are made to resemble white painted metal ones. Again the black printed screen surround is poorly done one an otherwise well printed model. 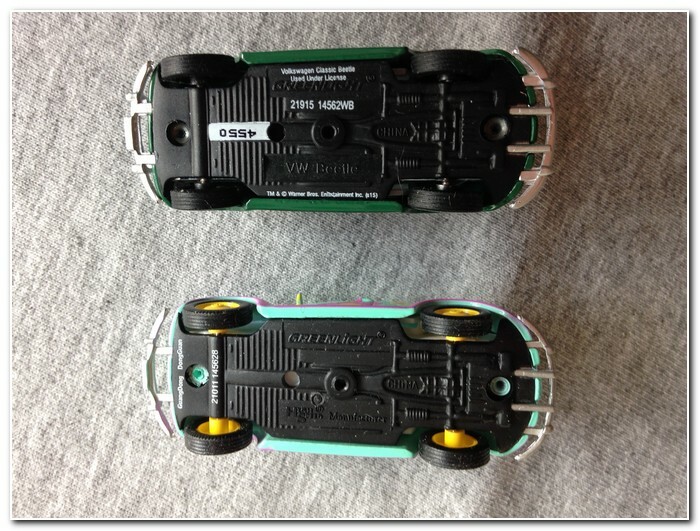 Underneath both models, M2 have moulded in some chassis features. Most photographs by, and copyright of, the Author. Where photograph is by, and copyright of M2 Castline, it is stated. 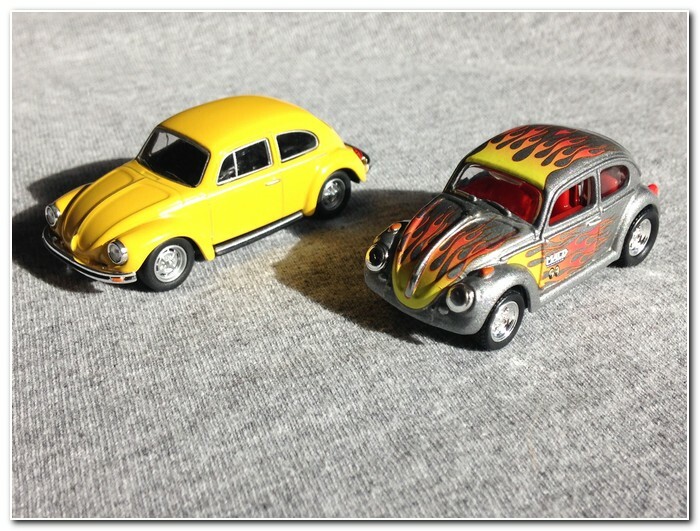 M2 have introduced an Auto-Japan line of 1:64 scale models diecast in China for USA. 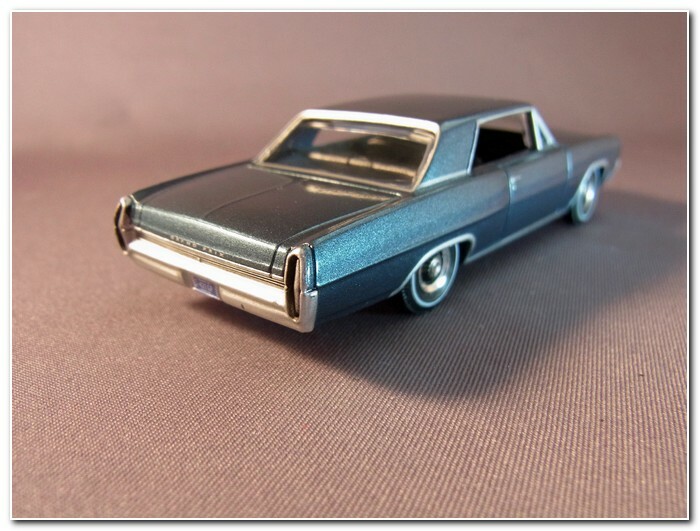 This article looks at the vehicles in “Release One” of this series and at the road car versions of the models in some detail. 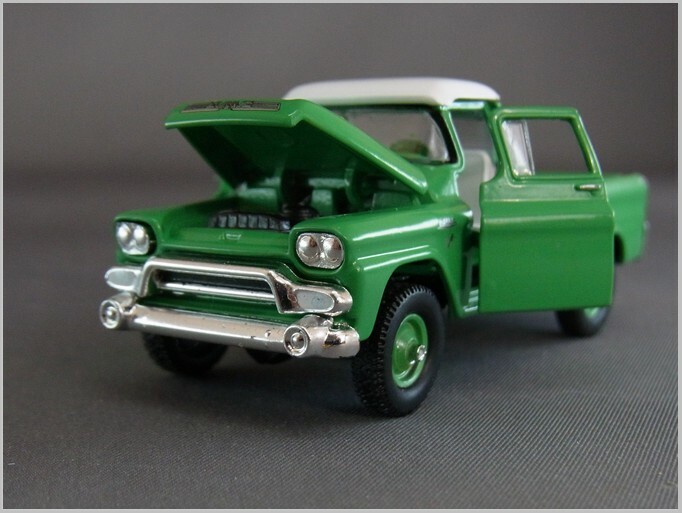 M2 are one of a number of US model firms that make 1:64 models to a constant scale with much more detail and better finish than Mattel Hot Wheels. Until now M2 has generally focused upon US made vehicles but this release covers Japanese vehicles originally introduced from 1969 to 1971. Many of these cars were imported into the USA but would have been left hand drive. All the models are actually right hand drive as would be the case in Japan and the UK. 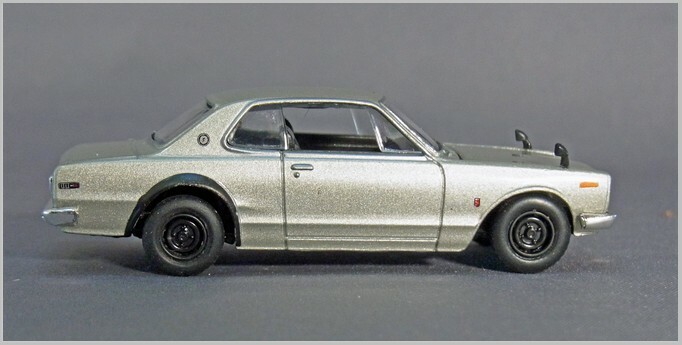 But these are clearly Japanese market cars as they carry names such as Fairlady never used on the UK market and I don’t believe that the Skyline GT-R was officially imported at this time either. Finally the style of wing mirror used was not fitted to UK cars. 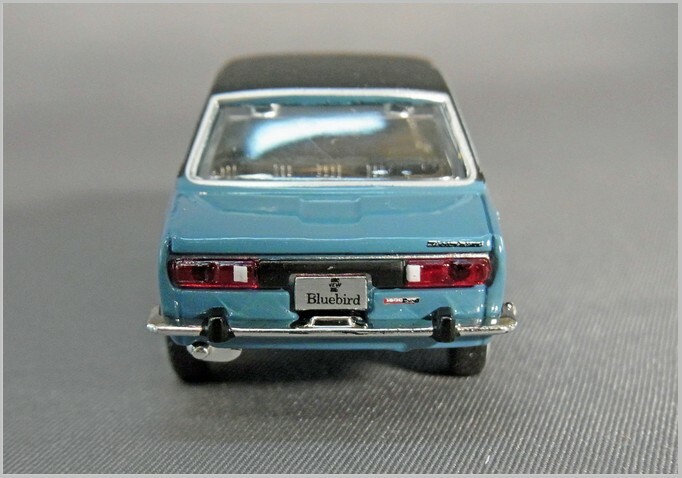 As these have the steering wheel on the wrong side for the American market will this limit sales or is the series intended by M2 primarily as an attempt to enter the Japanese market place? 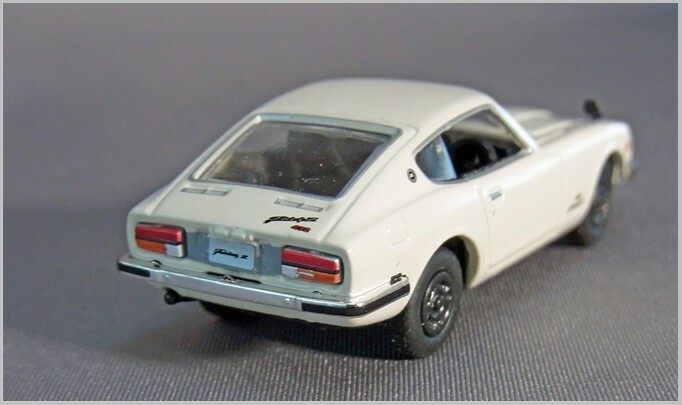 Datsuns were also built and sold in South Africa, Australia and New Zealand who also have RHD and unlike the UK they may have used the Japanese names for their versions. 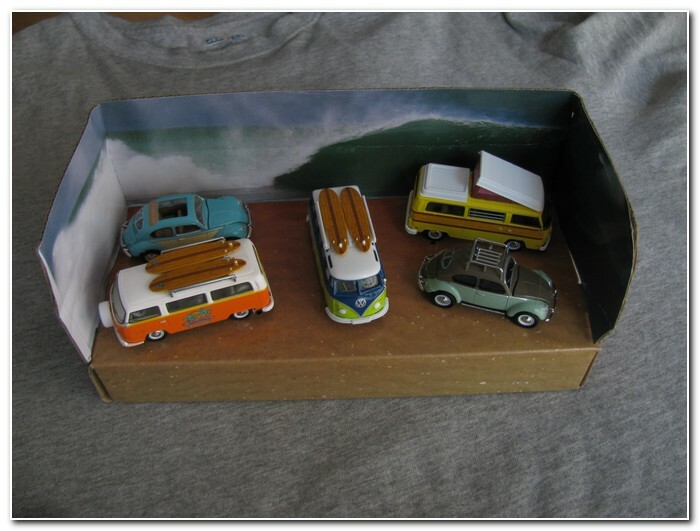 Perhaps these are perfect for collectors in South African, Australia and New Zealand? 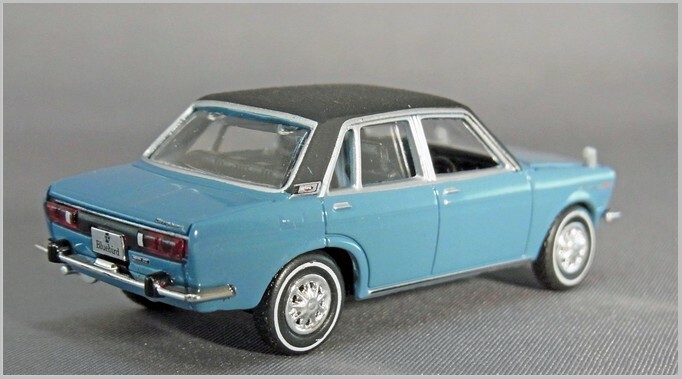 The Datsun Bluebird was their mid-range saloon competing in the UK with the Ford Cortina and Vauxhall Victor and Hillman Minx. 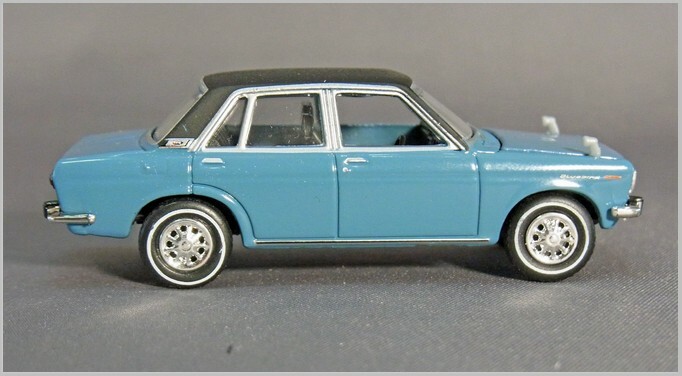 This model is of the 510 series sold between 1967 and 1972. The SSS model was the sporting version with twin carburetors and upmarket fittings originally badged as SS until Chevrolet complained. Side view shows that tampo printing has been used to show chrome window surrounds well. 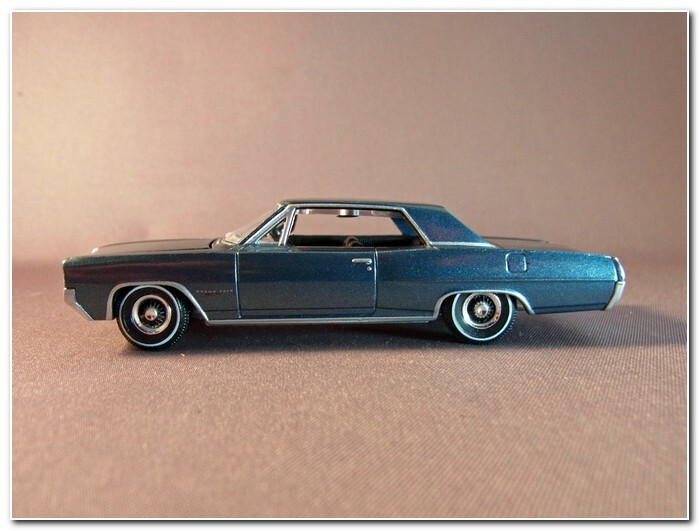 The three box shape has been well captured and the “vinyl” roof imitated well. Wheels are generally good though the white stripe on the tyres is not entirely centred on some wheels. The front end captures the car well but the moulding is a little heavy and the panel line round the lower valence too obvious. The printed badging and indicator on the wing are neatly done. From the rear the lights are nicely moulded inserts and the over riders have been picked out in black. 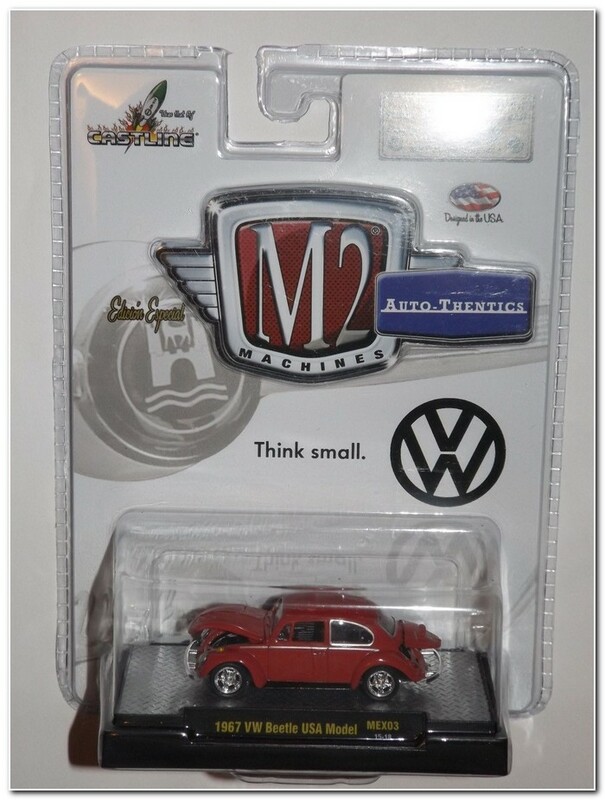 Tiny badging is printed well and only fully visible if enlarged several times. The engine is represented with the inline 4 cylinder engine dominated by the additional carburetors of the SSS version. 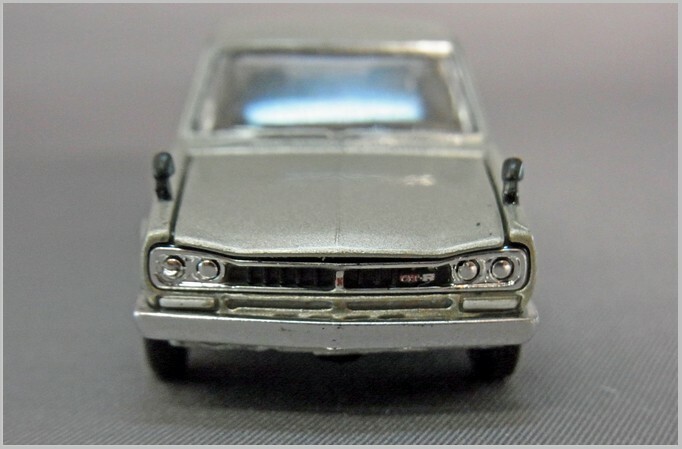 The Japanese style rear view mirrors are curiously left in grey plastic. Pictured below is the Racing Version which is largely the same model. The Z432 was a rare version of the Z240/260/280. 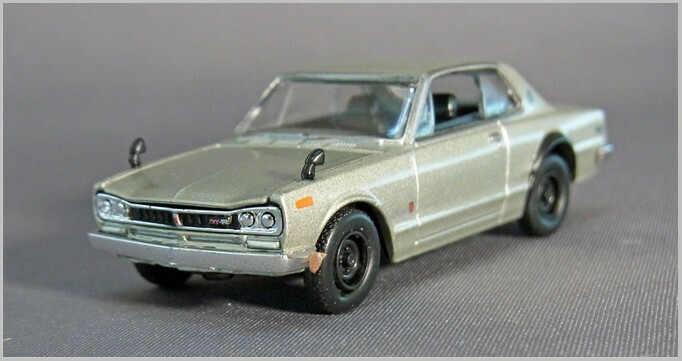 It was fitted with the heavily tuned engine from a Skyline GT-R and only just over 400 were ever built. The number exported from Japan must have been tiny. The racing version of the car Z432R was made in tiny numbers and was only sold in Japan. Side view shows the neat badging and neatly moulded wheels as well as the Japanese market wing mirrors. The front is nicely moulded though the bonnet panel fit is not up to the standards of some other models. 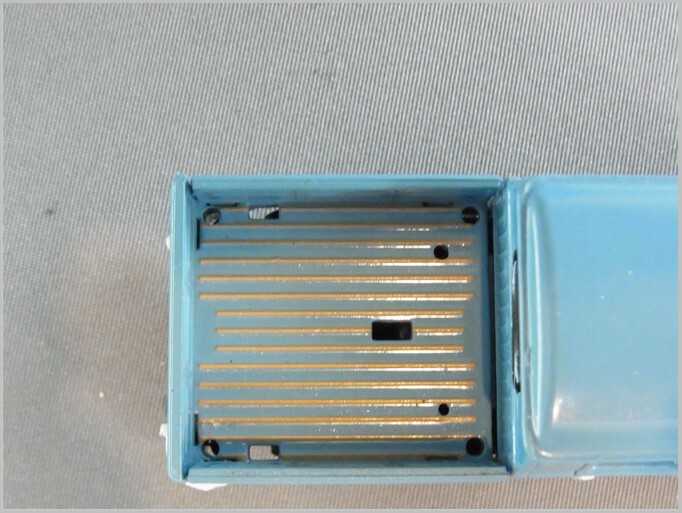 The grille has been blacked but is not neatly printed at the top with the “ragged” appearance obvious even without enlargement. The rear carries some nice grilles and printed badging. The lights are painted on silver effect inserst and are quite acceptable apart from scratching on one lens taking a line of paint off. The open bonnet shows a sketchy in line six and induction manifolds. 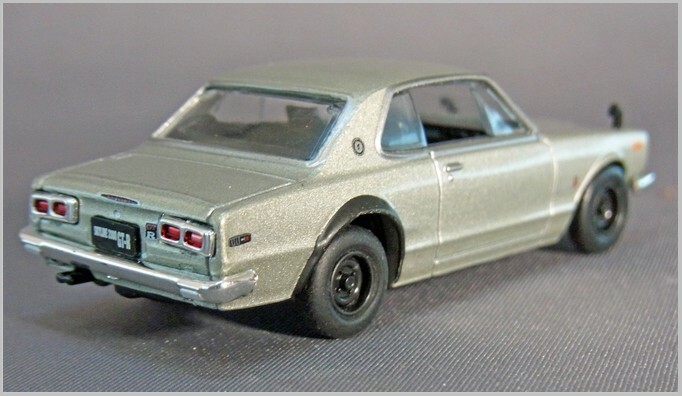 Again a racing version which is very similar other than wheels, bumpers and detailing. This lacks the black hood of the original R version so is presumably a Z432 lightened for the track. 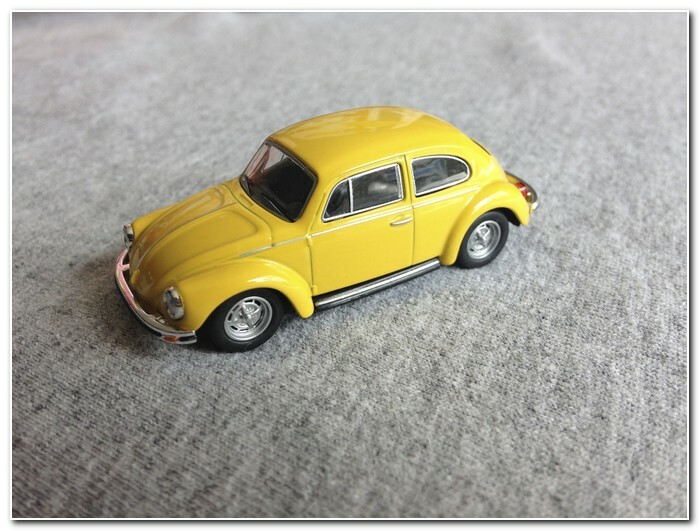 The coupe model was introduced in 1971 and fitted with a powerful inline six cylinder engine and a five speed gearbox. The GT-R was very successful in touring car racing. These cars have become a Japanese motoring icon and yet only around 2,000 of the first generation of GT-R were made. Side view shows the neatly printed sidelights and the badge on the C pillar and rear wing. The black wheels are neatly moulded and the black wheel surround at the rear painted on. The front end has been moulded well with lights and grille well represented and excellent tiny badging. The shape of the car is well captured as shown in this shot from the rear. 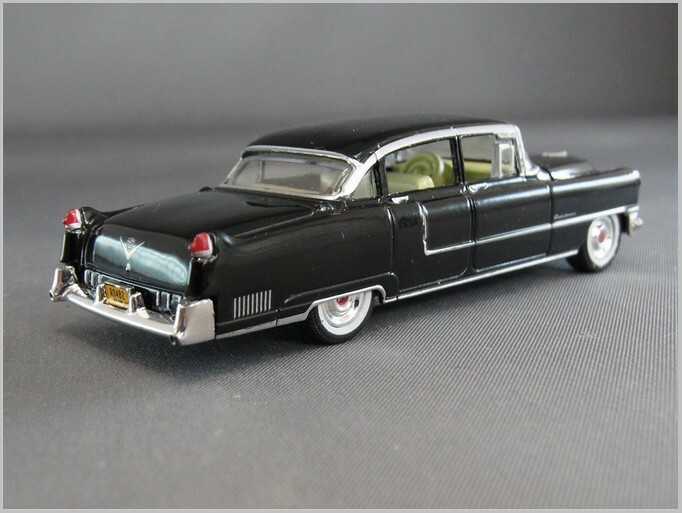 The front of the car shows the rather wide panel gaps round the bonnet which some makers of small models are now getting much less obvious than this. At the rear the lights do not fit straight, or the bumper, which lets down the overall effect. Nicely printed badging down to the small badge on the boot and reversing lights printed on the bumpers are positive features. The bonnet up shot shows the straight six and induction manifold but is only really a general impression of the engine bay. Another racing version based on on the standard casting. 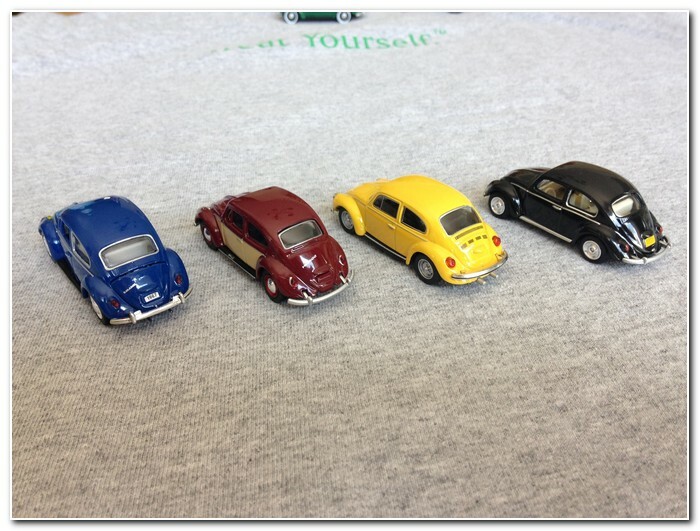 It is a US market ploy to add a few specially finished models to the boxes sent out to dealers. 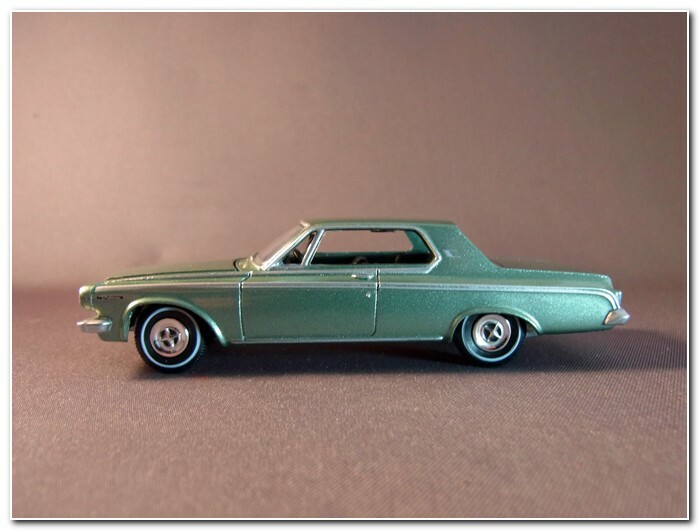 This has created a market of collectors who only look for these special models which are produced in unrealistic finishes with strange wheel colours and extra printing. The three chase cars produced for this series are shown below. 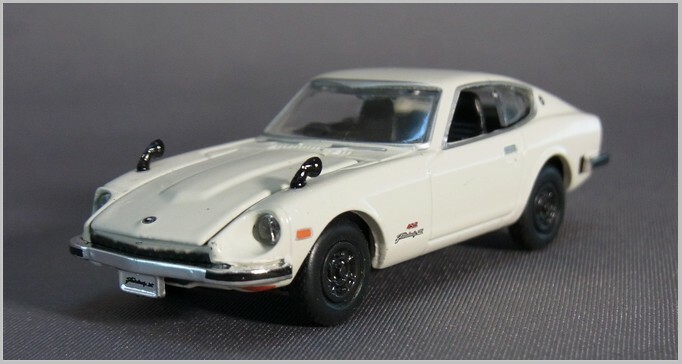 Although this series has nice models they are not defect free or as finely detailed, or crisply modelled, as Tomica Vintage Limited models. 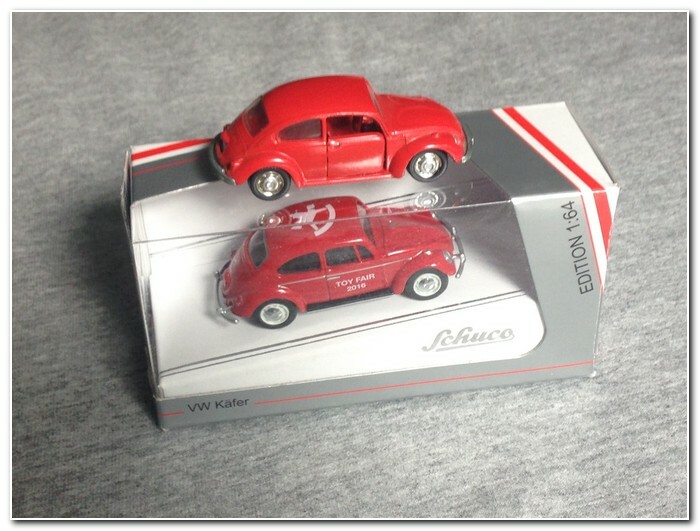 But then most US and European buyers will be able to buy the M2 models for a considerably lower price than Tomicas. 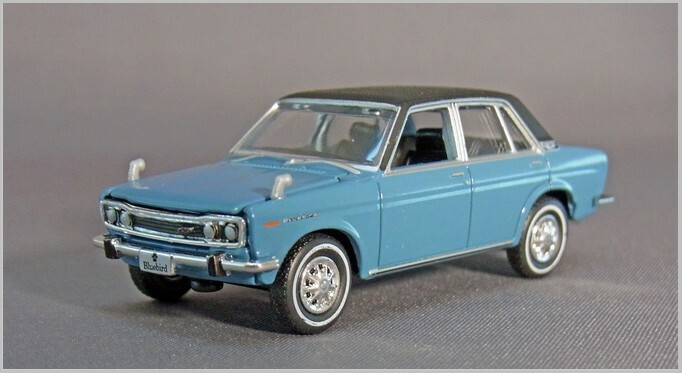 I hope that M2 continue with this range as there are a many classic Japanese cars yet to be easily available in constant 1:64 scale at a reasonable price. My collection of US 1:64 scale models has grown recently. As these are generally not imported into the UK I have to rely on my collecting buddy to obtain them for me in the US and Canada. 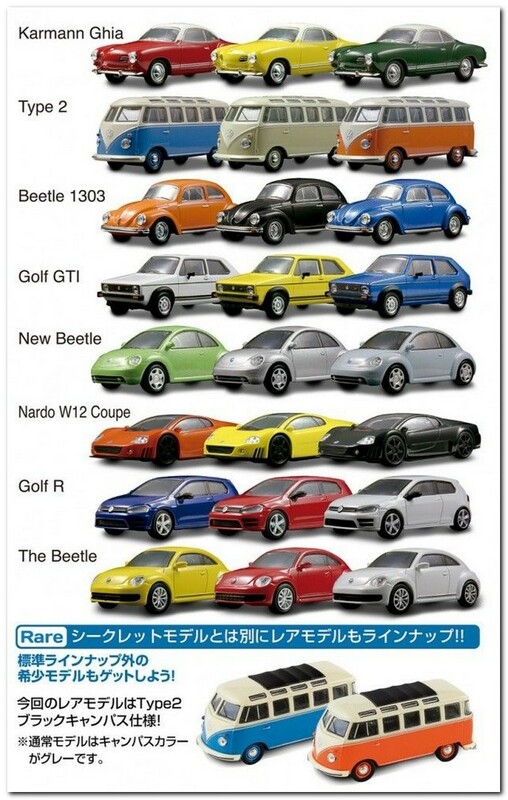 All the models shown are from “premium” 1:64 makers and cost considerably more than models from Mattel and Matchbox. In return there is much more detail and some excellent subjects. 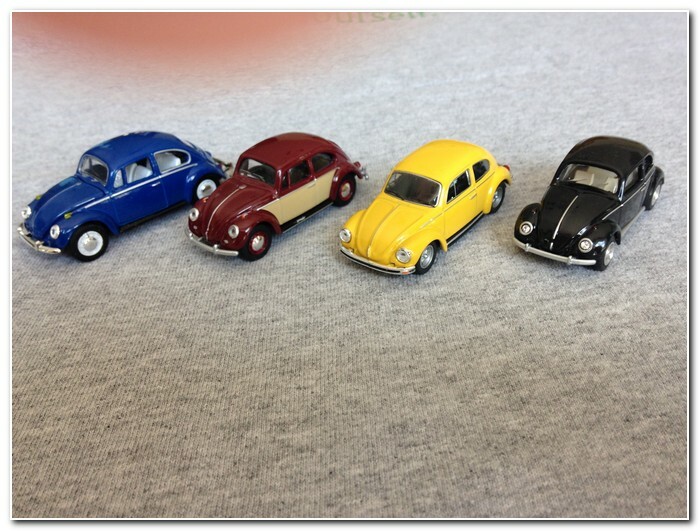 All the models shown have been diecast to 1:64 scale in China for the USA. I am told that this model is becoming scarce, particularly in black. 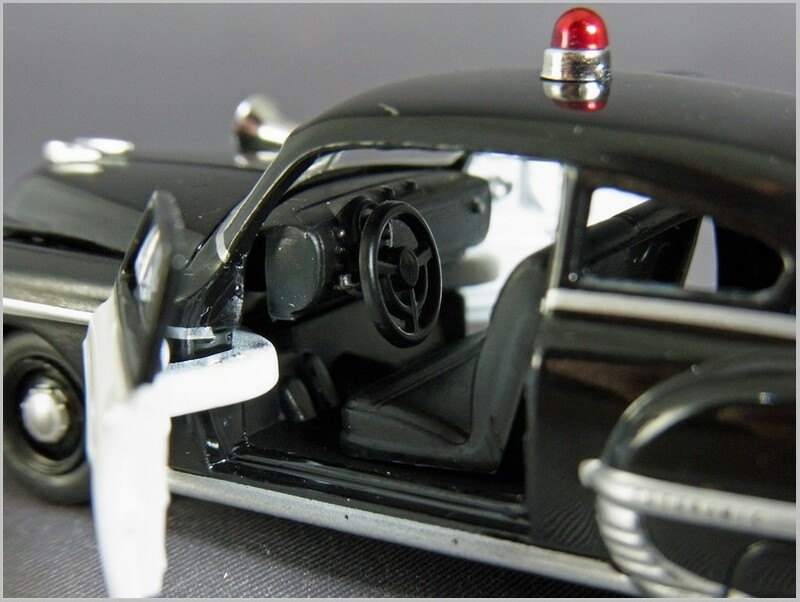 It is based upon a car seen briefly in The Godfather a gangster film from 1972. 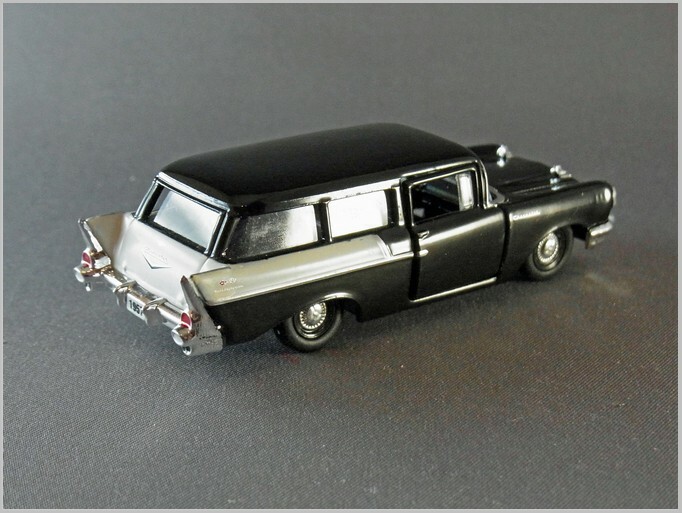 It is made to 1:64 scale and was sold in a blister pack with a Godfather film theme. 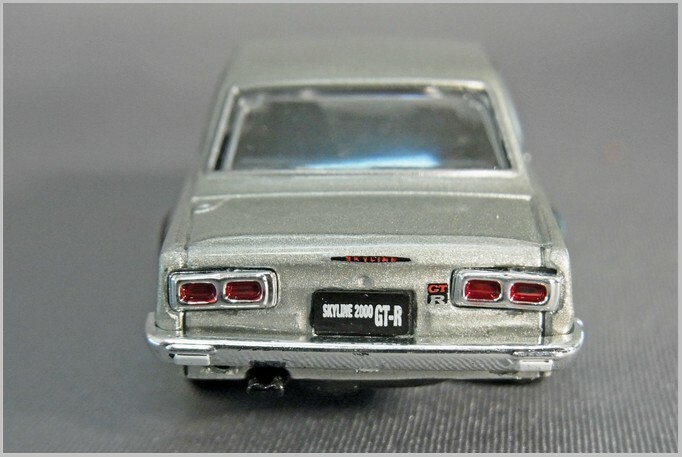 The rear number plate shows the same number as the car in the film, but the front number plate is much too small to match the car in the film whatever is printed. 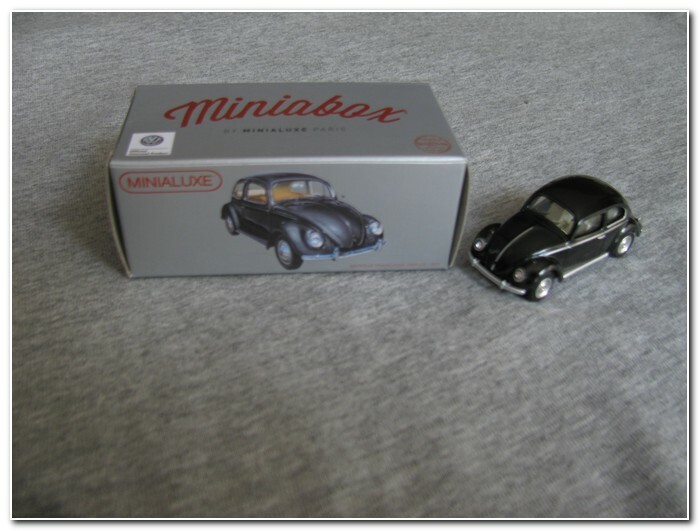 It was only looking at an advert online for this model that made me realise that the bonnet actually opens. The fit of the bonnet is so fine that one really has to congratulate Greenlight. 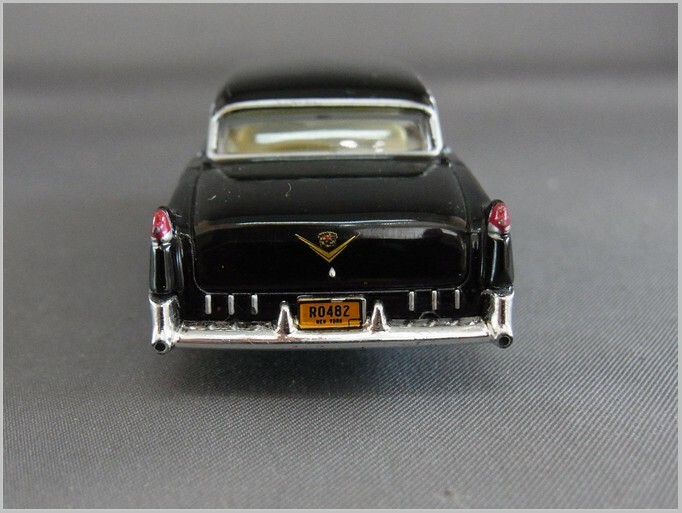 The printed chrome is neatly done as is the bonnet mounted emblem and Cadillac scripts. Looked at from the side one of the models shortcomings becomes apparent. The very slim door posts should all be chromed. 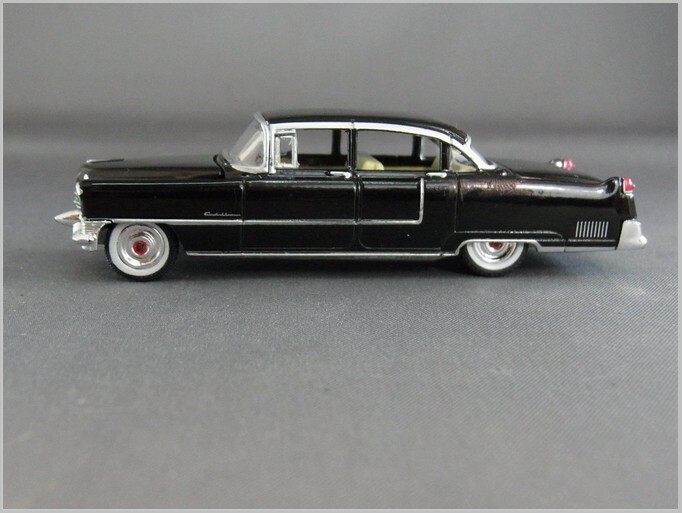 The wheels are good with wheel centres correctly printed in red with the Cadillac emblem included. 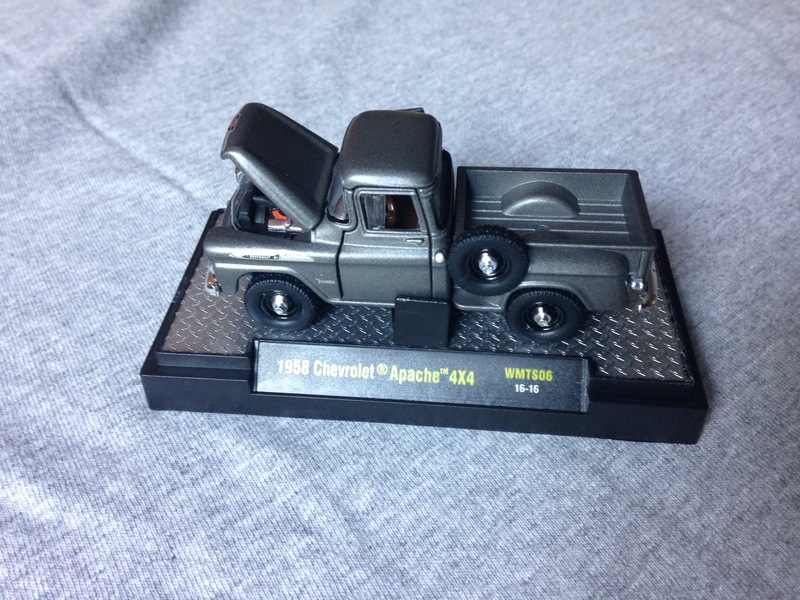 The base is in unpainted metal and includes quite a bit of engine and powertrain details as well as the ladder chassis. The front also shows a few issues with the “dagmars” being too large and the black tips not extending back far enough. 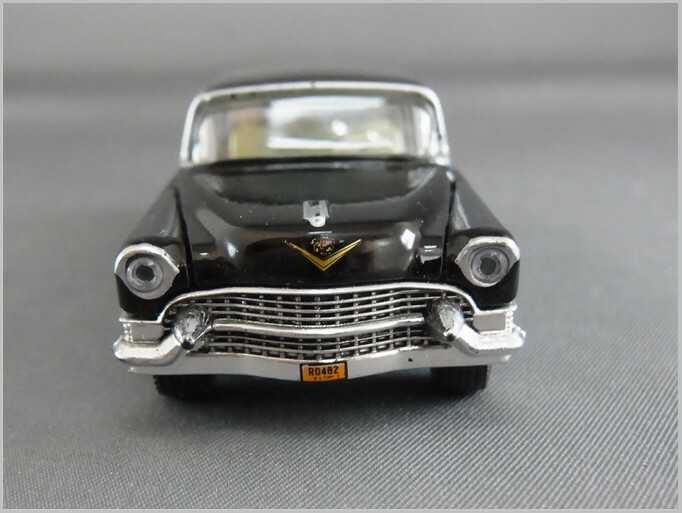 The Cadillac crest is also printed off centre as shown by its position to the side of the bonnet ornament. However, this is a budget model and is generally very good so is a nice item to add to my collection. Greenlight also make this model to 1:43 scale. 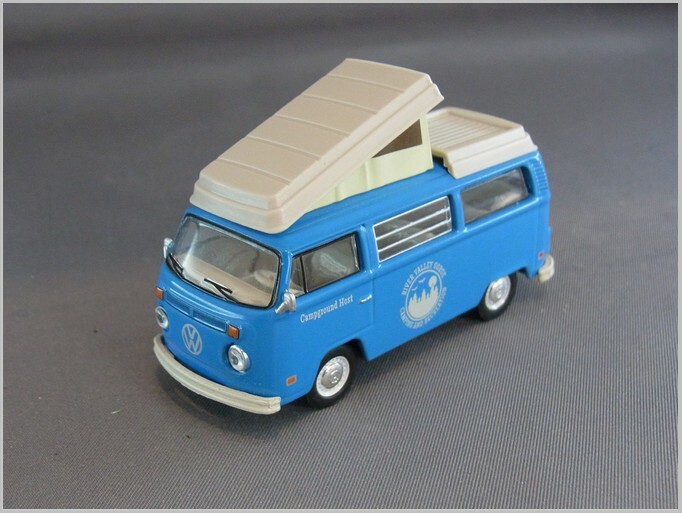 Greenlight have produced several different camper configurations on the VW T2 US Bus. 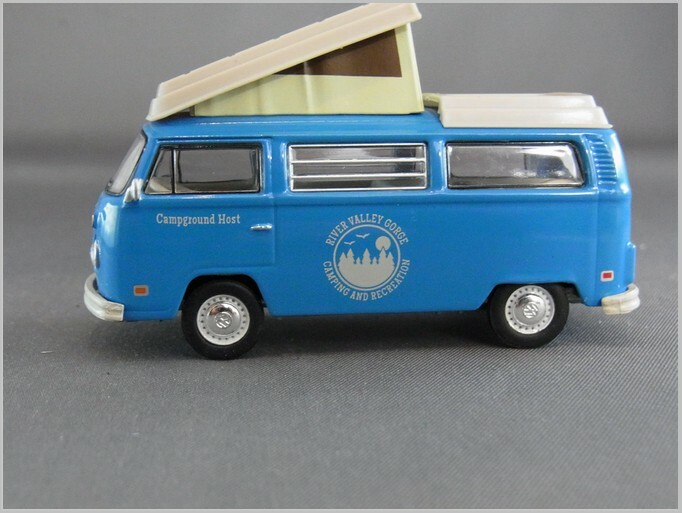 Here it is in “Campground Host” trim with the folding high roof and raised luggage area but with no camping fittings inside just seating for about 10 people. 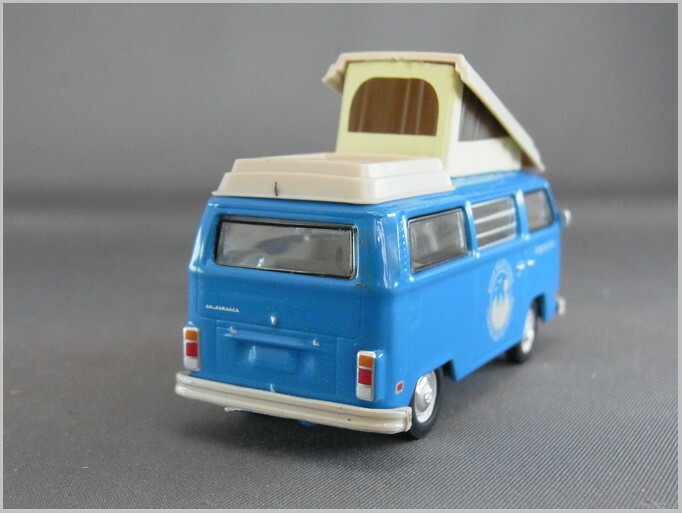 It is another model in their Club V-DUB range which has no opening parts. 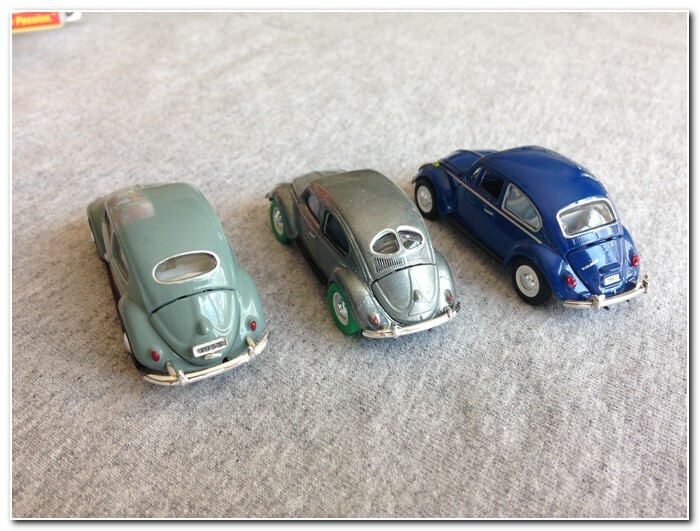 It is thought that Greenlight uses a different maker for this range of VW models, probably one making VW models for the European market. The roof is nicely constructed but the windows in the folding part of the roof are just printed on., though quite effective. Elsewhere the printed grilles, window slats and lighting are very well done. The wheels are particularly nice with the domed hub caps and VW logo impressed in the middle. Number plates have not been printed on which is a shame as it makes the rear look a little unfinished. 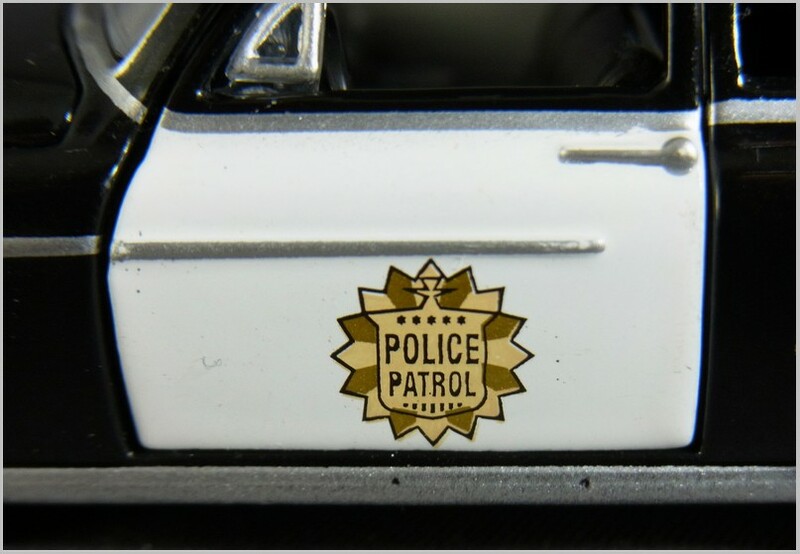 But the US regulation lights on the vehicle sides front and rear are printed on. The logo for the probably fictitious “River Valley Gorge, Camping and Entertainment” is neatly printed. 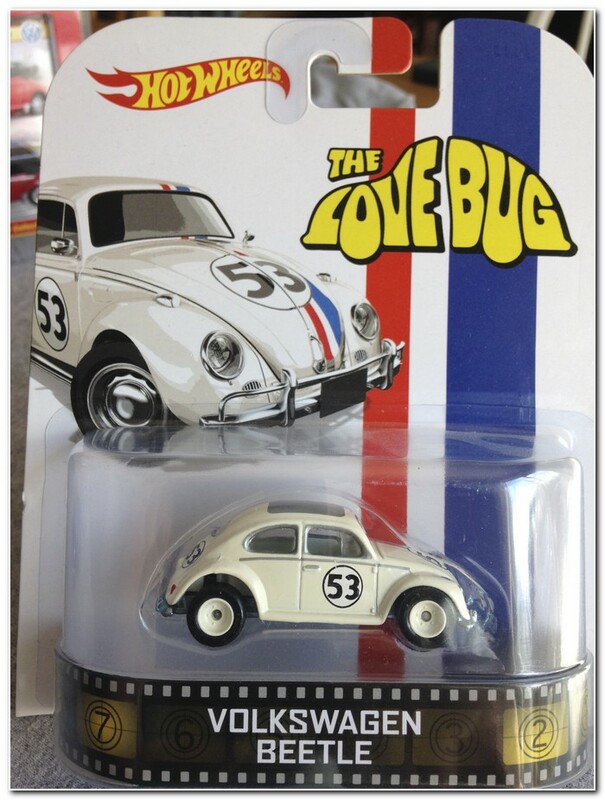 The only slight let down is the VW emblem on the front which is just printed and lacks the depth it should have. 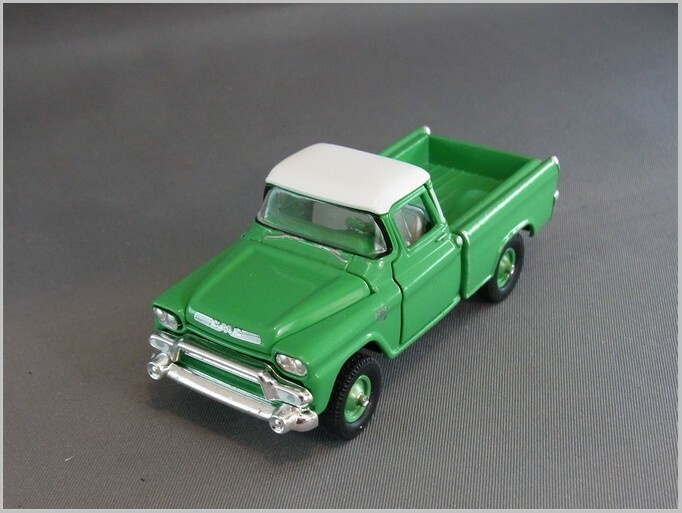 Here we go to M2 Machines Auto-Trucks range. This model is from Release 36. It is of the upmarket 4×4 version of this truck whereas previous appearances in Series 21 were of the plainer Fleet and Small Window versions. The rear bed is a separate part allowing different types of rear section to be fitted. 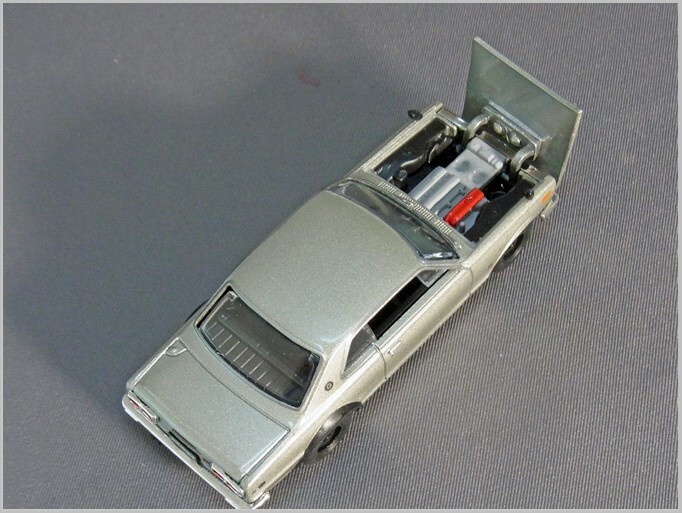 In series 21 the bodies were step sides and not the panelled in version used with this model. The printed GMC badgework on the bonnet is excellent as is the badging on the side of the wings. The grille and lights are impressive especially as the sidelights are actually a separately made and inserted plastic lens. 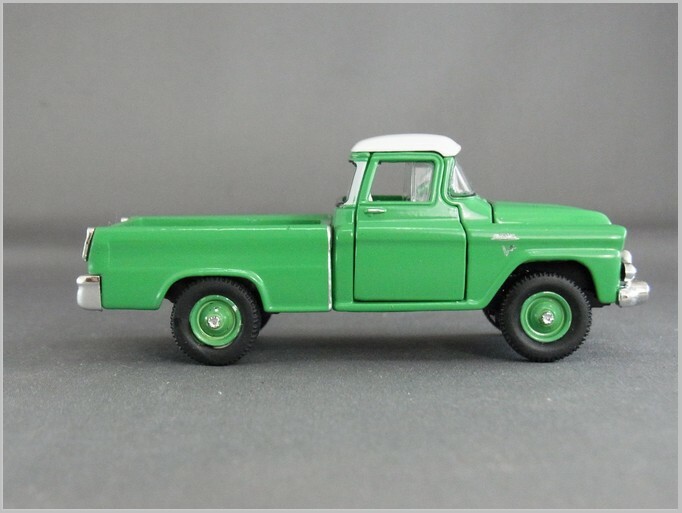 The wheels are neatly painted with chrome centres and large as would be the case for a 4×4. 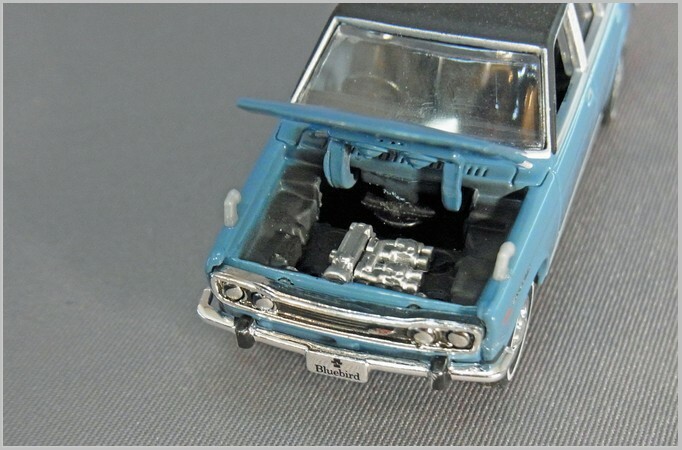 M2 models generally have many opening parts and here the bonnet and doors all open. 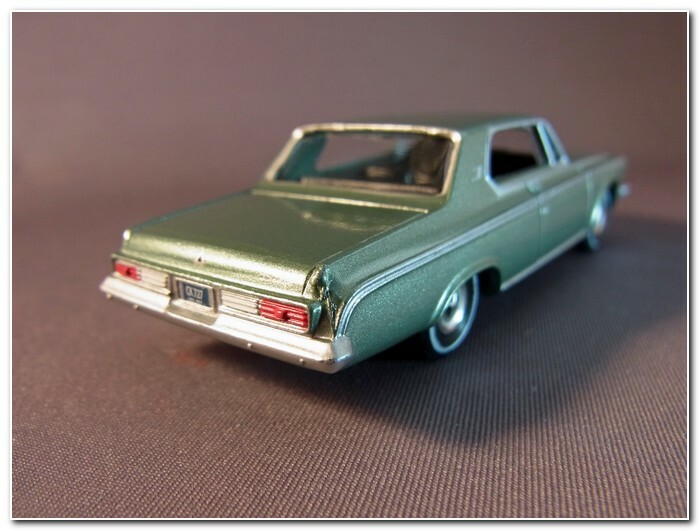 The panel gaps are a bit large but better than many 1:64 models. From the side view we can see the 4×4’s higher ride height. 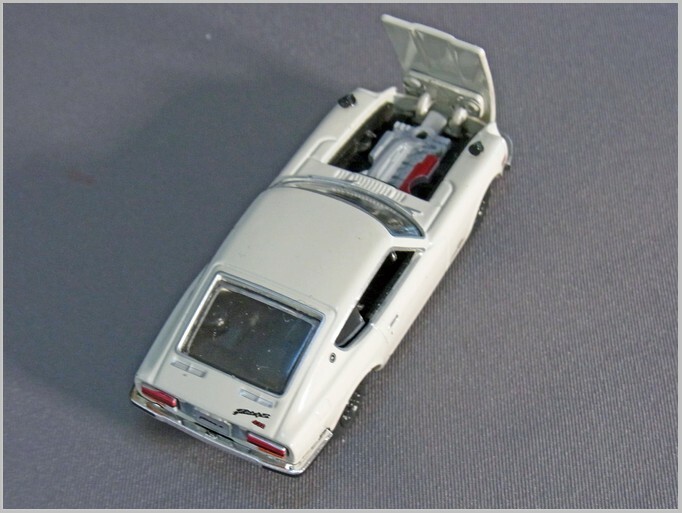 As can be seen the rear lights are transluscent red and solid white paint on plastic chromed units. These are effective at this scale. The complicated rear bumpers have been nicely made and the number plate shows the model year. 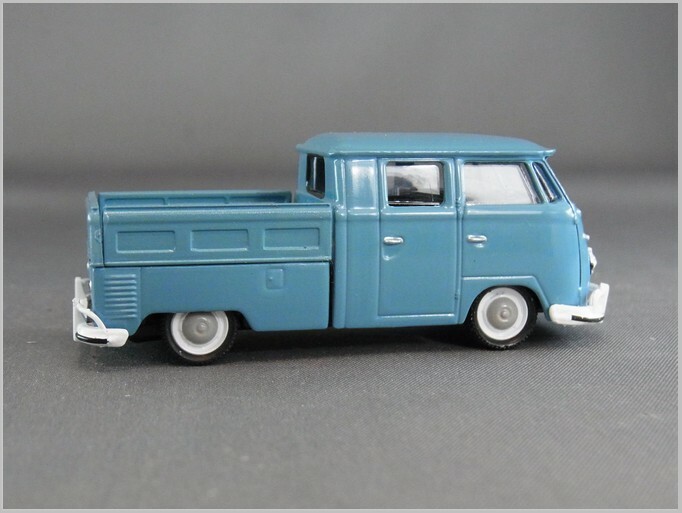 M2 1959 VW Double Cab Truck USA Model – Camper. 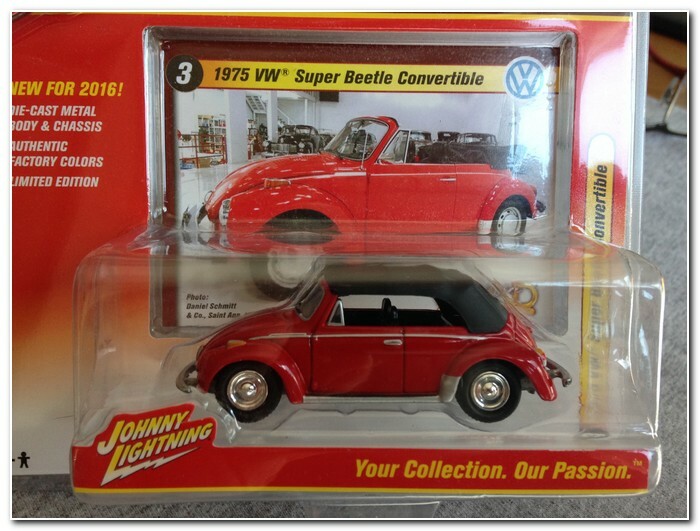 This special model is not part of a normal Auto-thentics VW release. 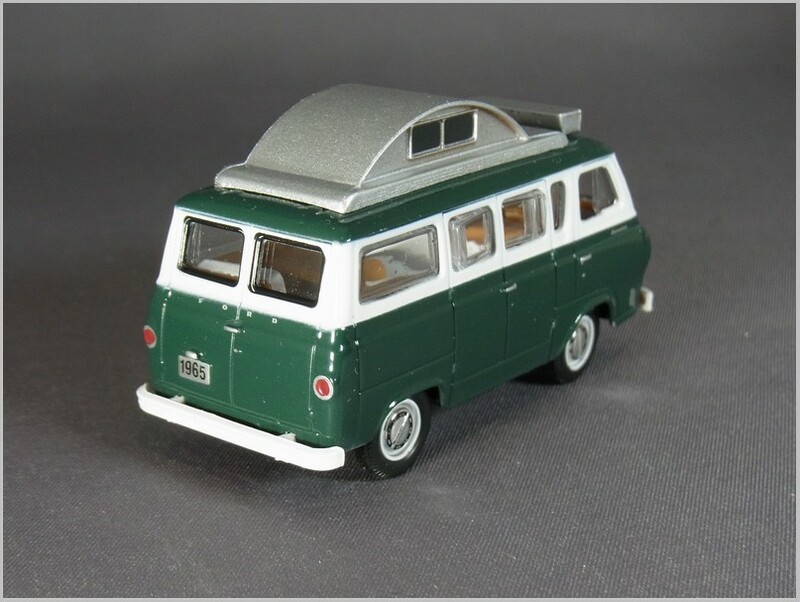 Using the VW T1 double cab seen in release VW004 it has a camper body mounted on the rear of the chassis and a deluxe two-tone paintwork. 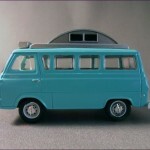 The Camper rear is fitted out inside in brown plastic with tables and cupboards visible. The front bumper has the higher export bumpers needed to comply with US bumper height rules. Unfortunately the front bumper droops a little as can be seen above. Whilst the rear is a custom build it has incorporated the standard VW engine access panel. The lights are a simple printed circle. The whole rear section has been made in plastic whilst the double cab is in metal. The rear window has “Industrial Speed Shop” printed on to replicate the type of sticker that might have been fitted to the original vehicle. 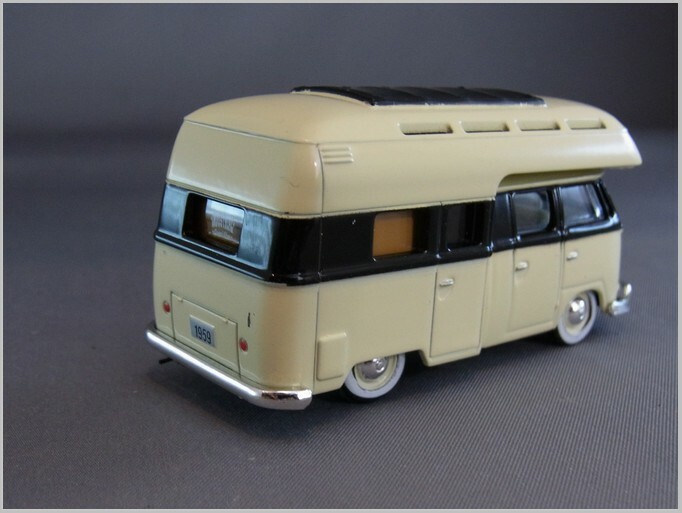 The large camper body must have been quite a weight to haul for a Type 1 Transporter which only had a 1200cc engine at this point. 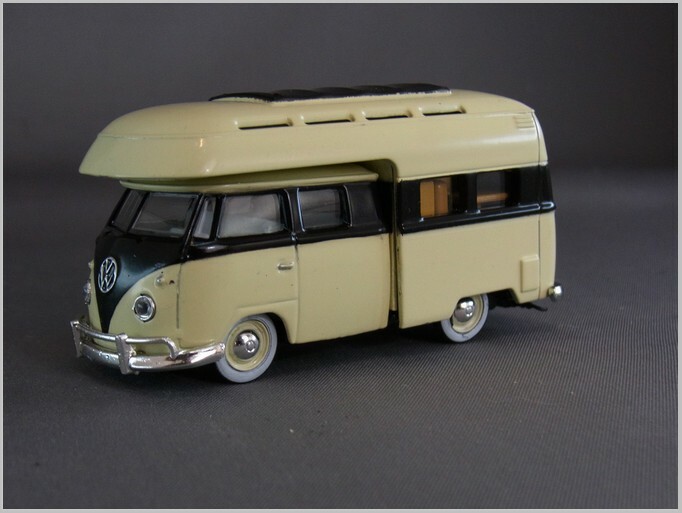 Indeed in 1959 the engine was uprated with more power but was so troublesome 1959 Volkswagen T1s in the US were recalled and fitted with modified engines. Making use of the same casting this model is a Walmart special and is a limited edition of over 7,000 models. 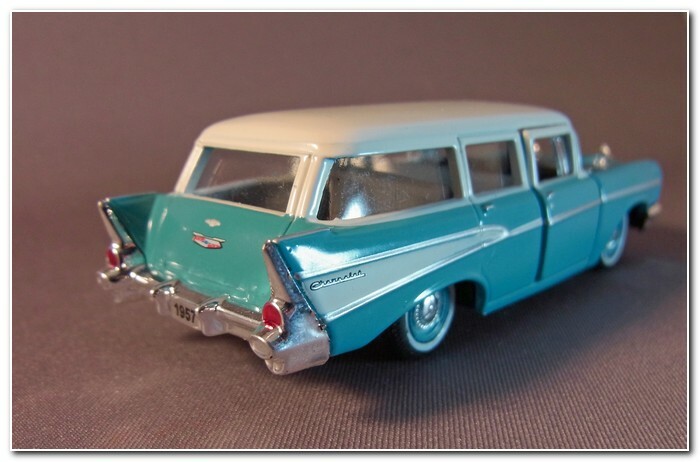 It has been kept simple and built down to a price as Walmart insist on being able to sell the models for low prices. 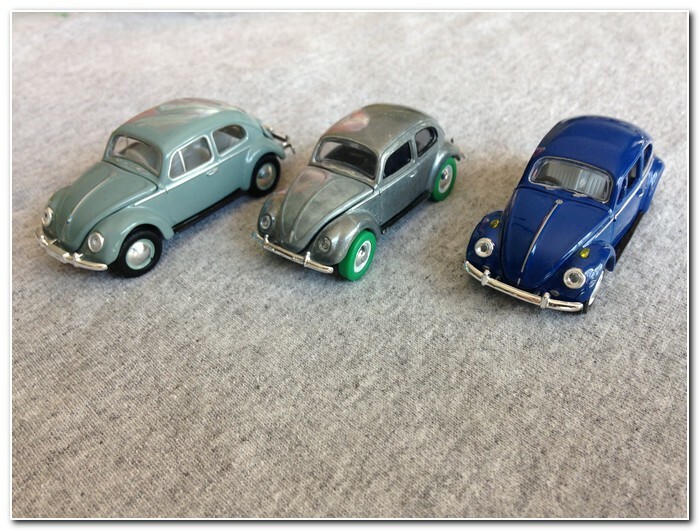 The blue colour is that associated with Volkswagen and is neatly painted. 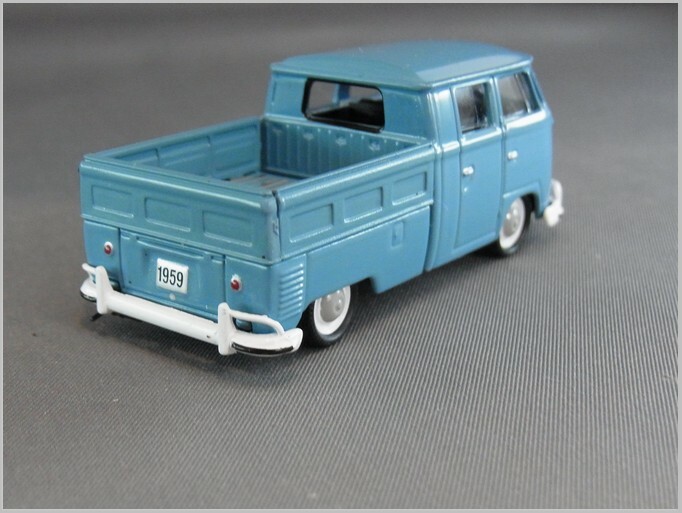 The double cab and pick up bed are separate parts but in this case they are both diecast. 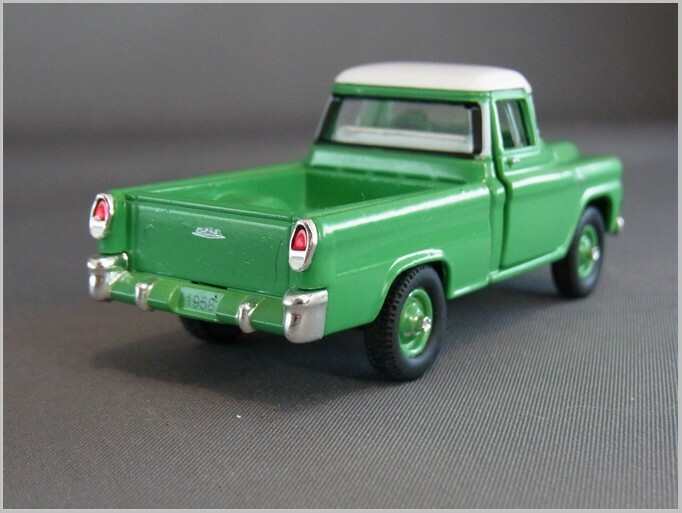 Although the drop down panels of the pickup bed are all plastic. 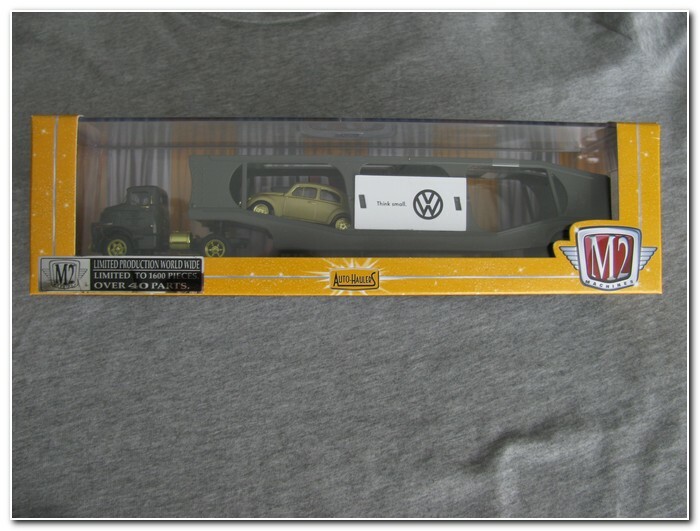 Unlike the Greenlight the M2 Volkswagens have the VW badge moulded into the cab and then overprinted in white. This gives a very realistic finish. 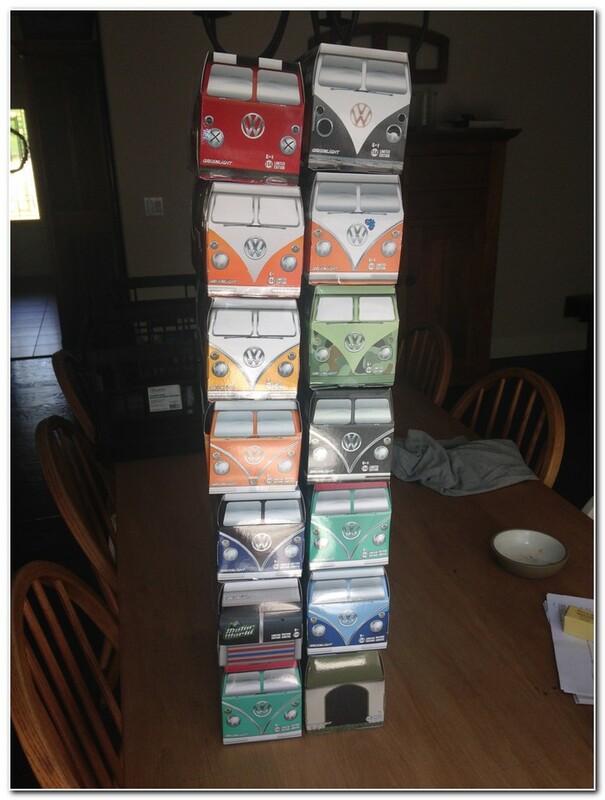 The white bumpers are US edition and have rubber strips printed on. The rear is simple but the drop down panels have been finelly modelled and moulded in plastic. The lights are neat red on silver prints. 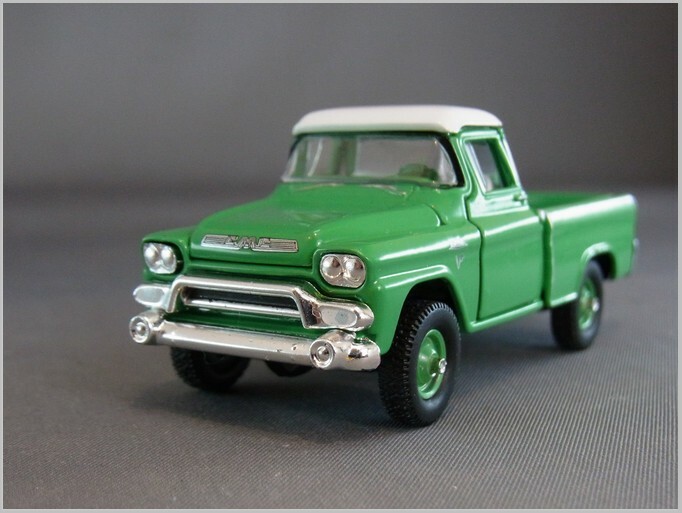 Looking in the pickup bed one can see that it was designed to be fitted with something and the holes have not even been blanked off – another sign that Walmart model is built down to a price. I expect that this casting will appear with a towing boom, or items fitted into the rear at some point. 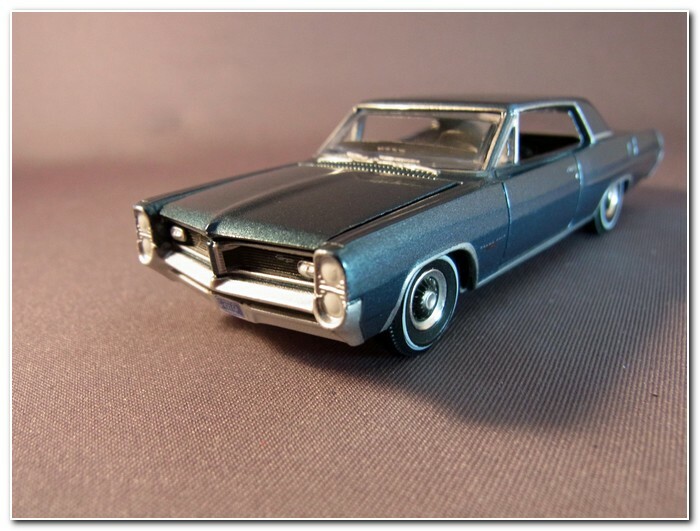 These models are just a small cross section of the up-market 1:64 models sold in the US and many more can be seen on the websites of M2 and Greenlight. 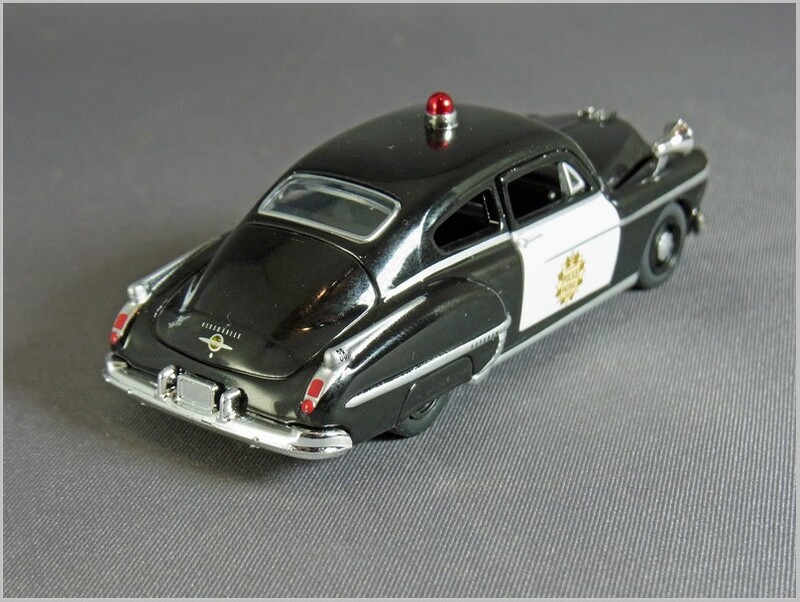 This M2 release 39 Autothentics model is diecast to 1:64 scale in China for the US. 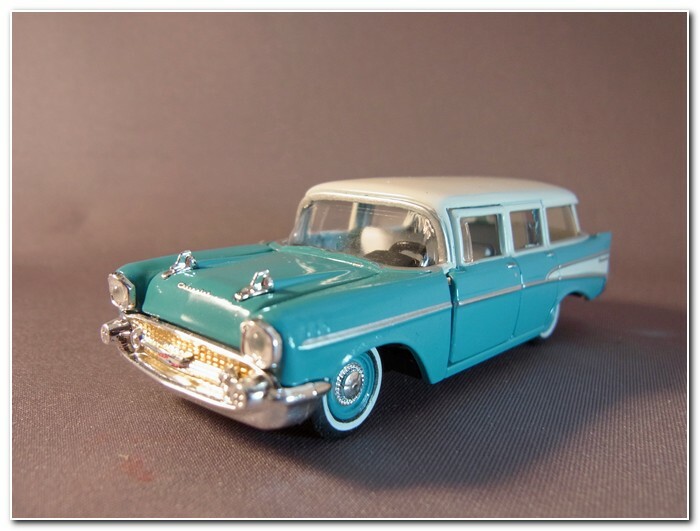 Unusually M2 has chosen to model the bottom of the station wagon range for 1957 the Handyman which had only two doors and a lot less chrome trim than the four door 1957 Chevrolet 210 Beauville Station Wagon already produced in release 35. The 150 was also the basis for the Sedan Delivery so I wonder if M2 will also do that at some point with the livery possibilities that will offer. The 1957 model year 150 kicked off with a straight six but that was dropped in favour of the 235 V8 Blue-Flame engine as standard. 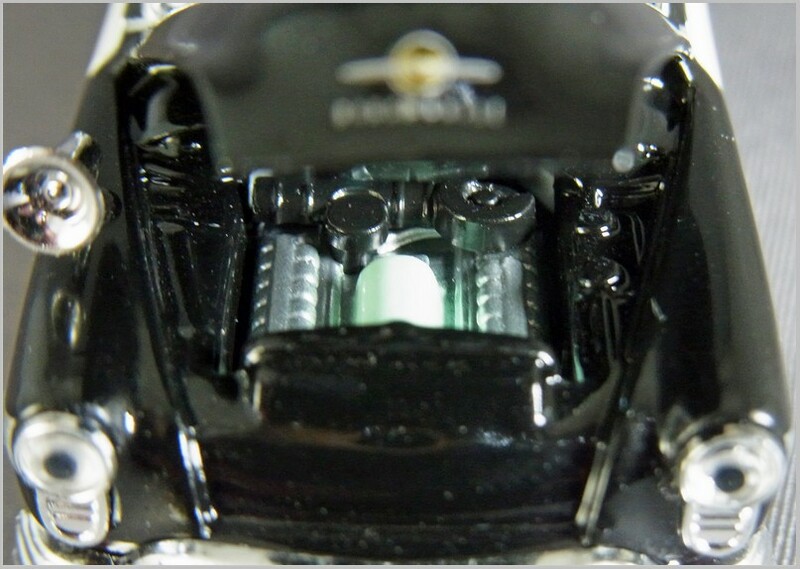 Lift the bonnet of the model and the engine shown is a V8. 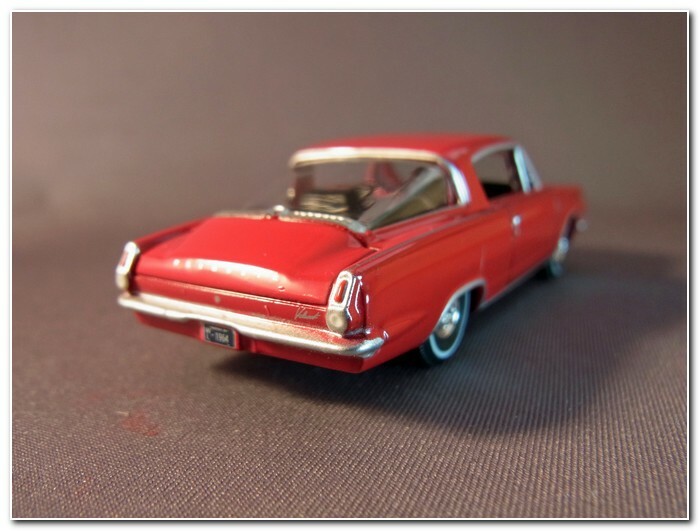 A manual gearbox was standard but Powerglide or Turboglide automatics were available. Performance was good by contemporary standards. 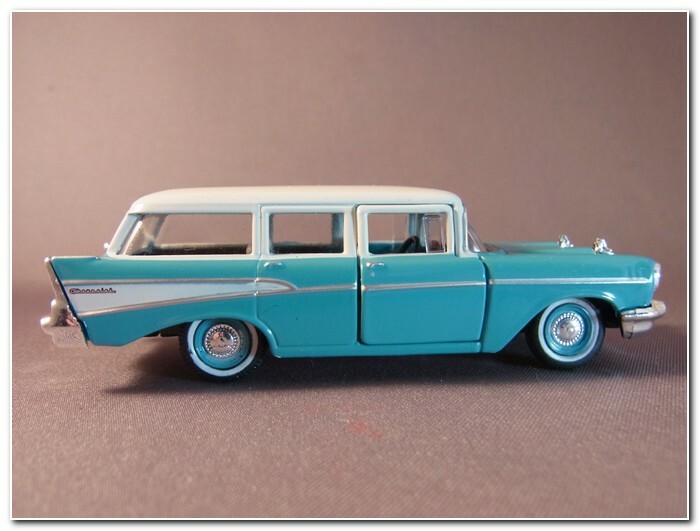 Although the 57 Chevy is a classic released time and time again for model collectors it was actually Ford that sold more 57 cars. The M2 model is to their usual standards and the doors, though opening, are properly full framed and have acceptable shut lines. All the lights, grille and badging are well represented and the simple wheels and hub caps capture the bottom line trim well. The Handyman logo is printed on so small I had to get a magnifying glass out to confirm it was there under the flags on the rear wing. Whilst the colours are totally unauthentic it looks much better than the silver colour used for series like this by Corgi, Ixo and others. 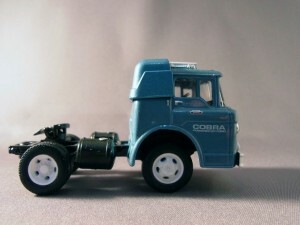 M2 have produced a number of these Autohaulers with various cabs, the Dodge COE for example. 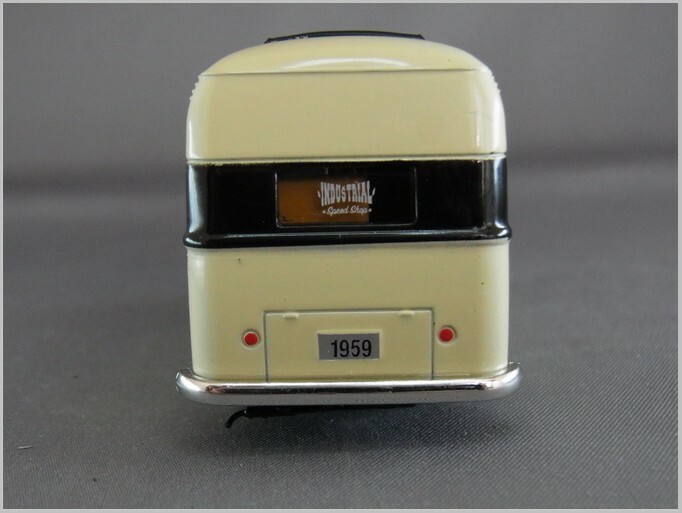 The latest cab is the classic Ford tractor unit from the 1960s which is well captured on this model. 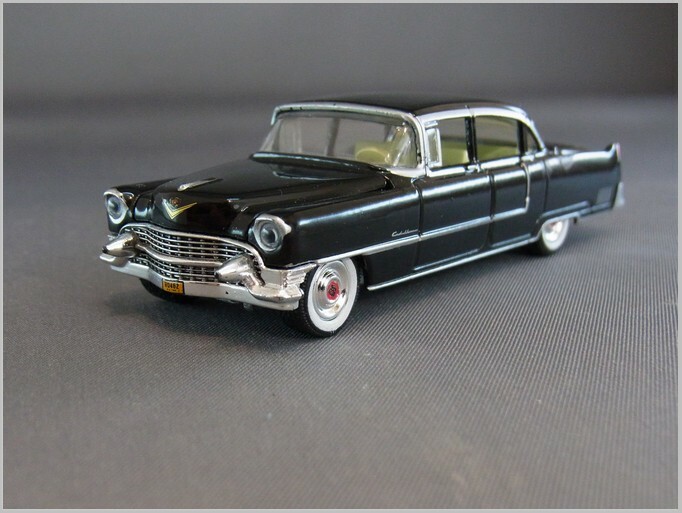 The models is made in a mixture of diecast and plastic components in 1:64 scale in China for the US. 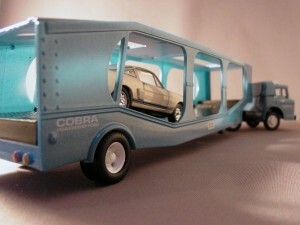 The cab is shown here on a hauler in Shelby livery and it can also be found in white in Shelby livery with a hot Mustang in red. The Mustang on this blue outfit looks very like the classic models that Hertz rented out. M2 products are relatively inexpensive so the rather plastic appearance of the grille and trailer unit can be accepted. They even supply a set of plastic ramps to help get your models on board. 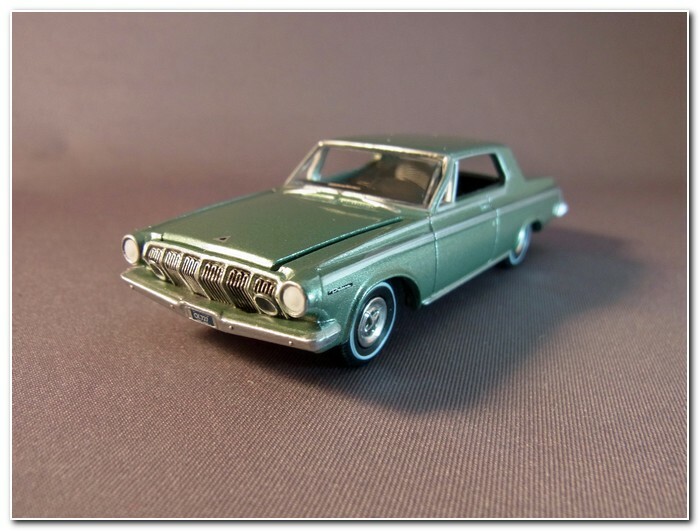 This is an unusual model from M2. 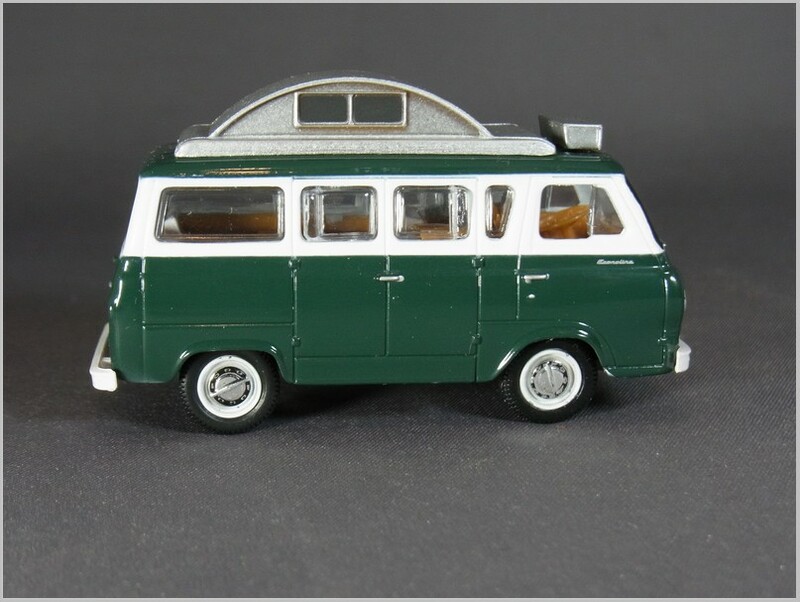 Absolutely nothing opens which means that it will appeal strongly to collectors who up till now have had no choice of campers in 1:64 scale other than which Type of VW Transporter Camper they should buy! 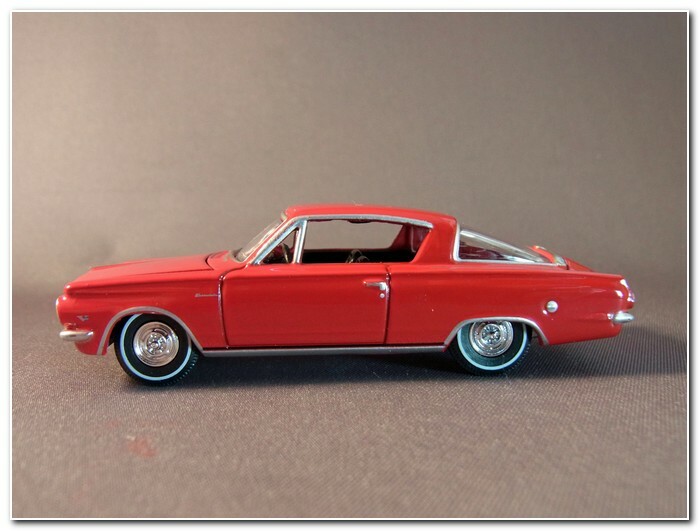 A simple model with a few quality issues like bits broken off the wheel edges. However it is otherwise very good with a nice air conditioning unit on the roof as well as the extended roof to allow people to stand in side. The interior is basic but shows the table and panelling to reasonable effect. All in all a really nice budget model. 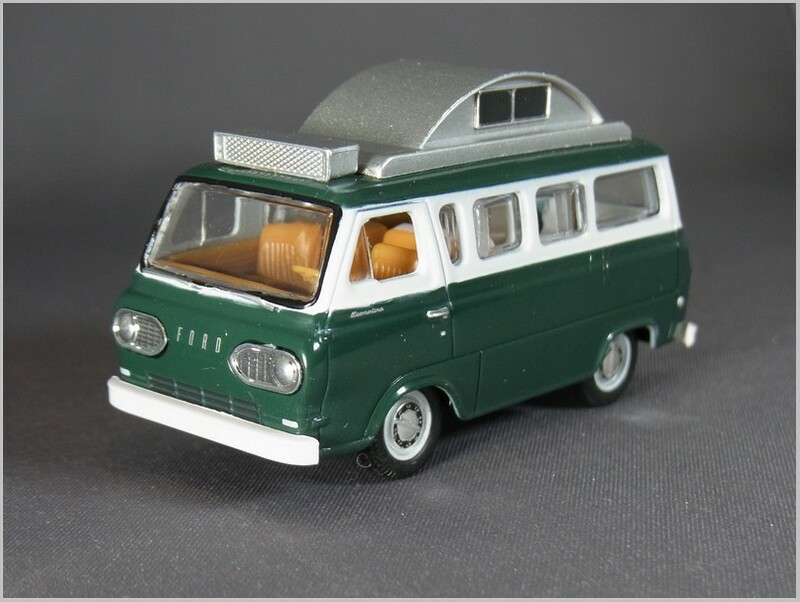 Hopefully M2 will also give us vans and passenger carriers in 2016 based on this casting?